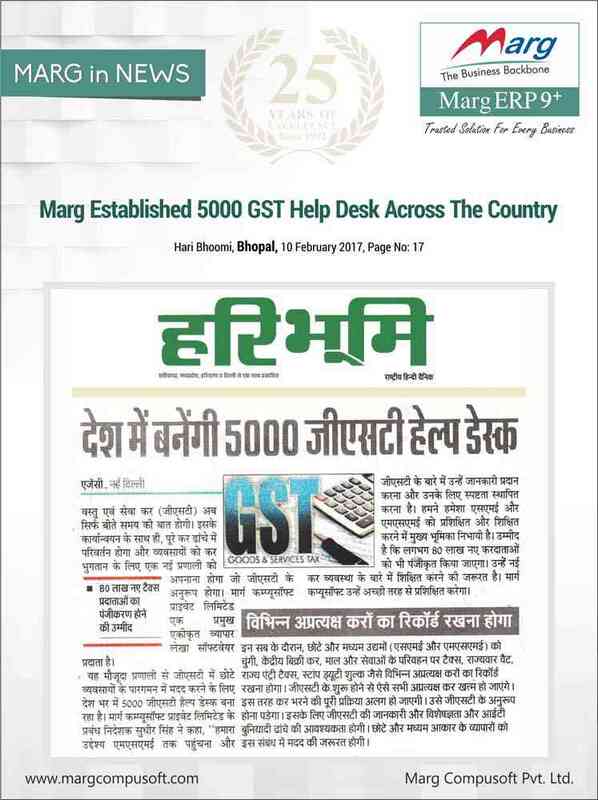 Marg ERP dega GST ka Muft Software. 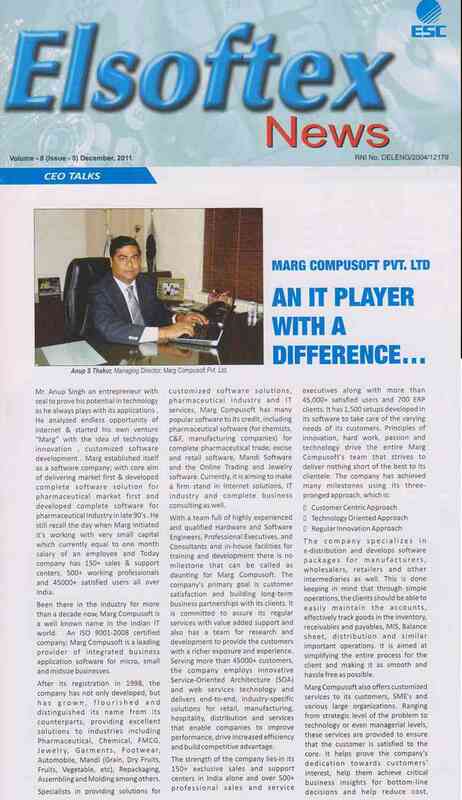 Marg Education Collaborates With Oxford Software Institute For Training of Marg Software. 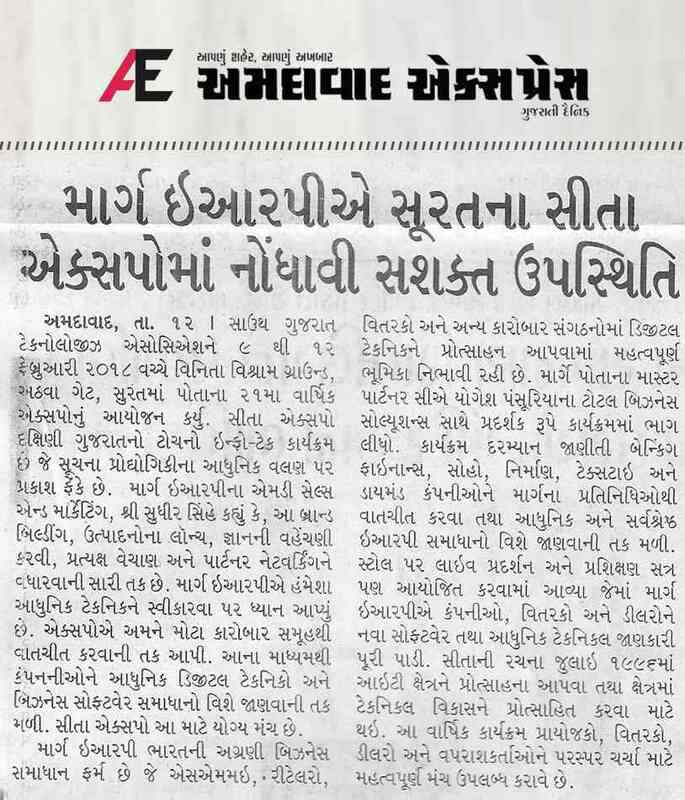 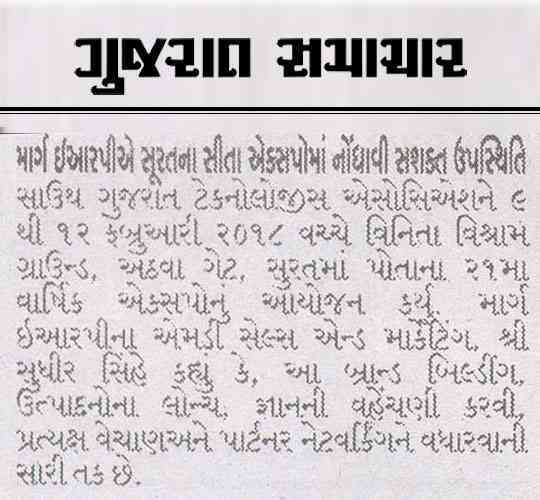 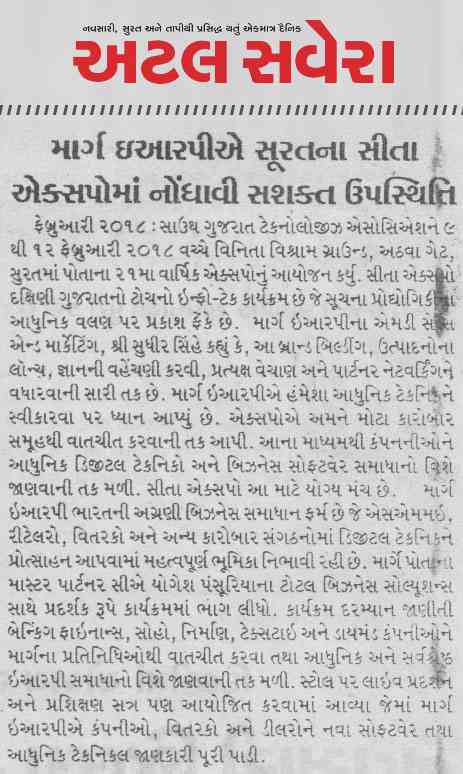 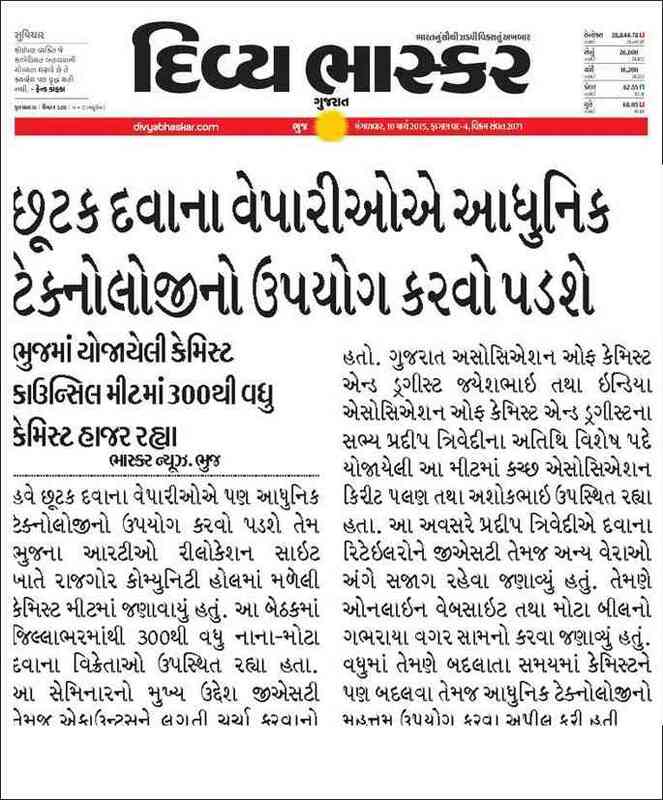 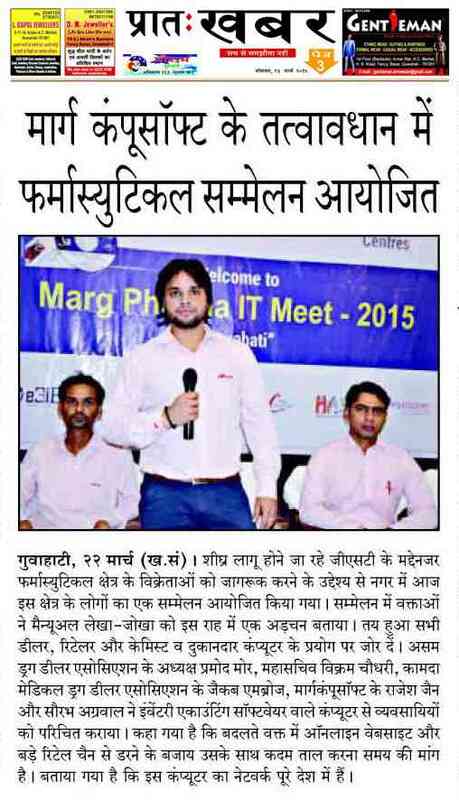 Marg Education Join Hands With Oxford Software Institute For Training Youth. 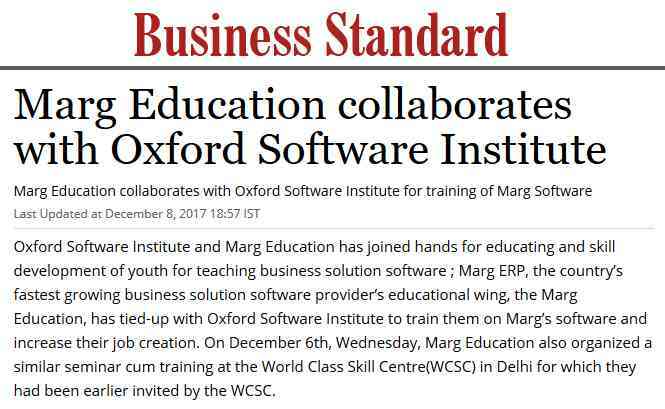 Marg Education collaborates with Oxford Software Institute. 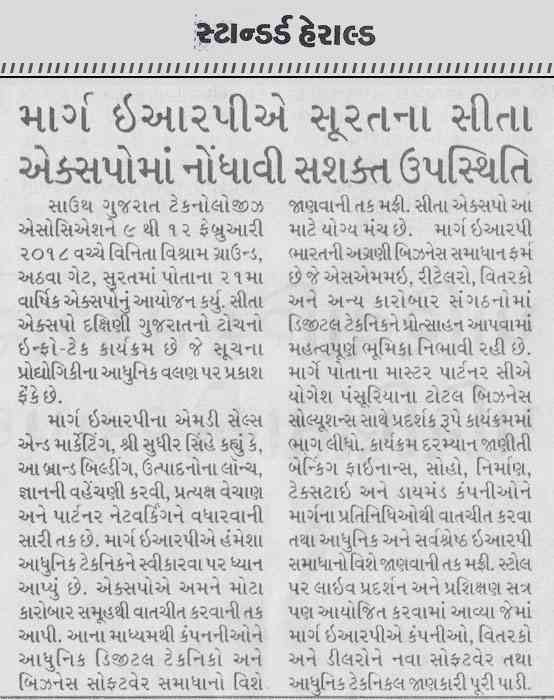 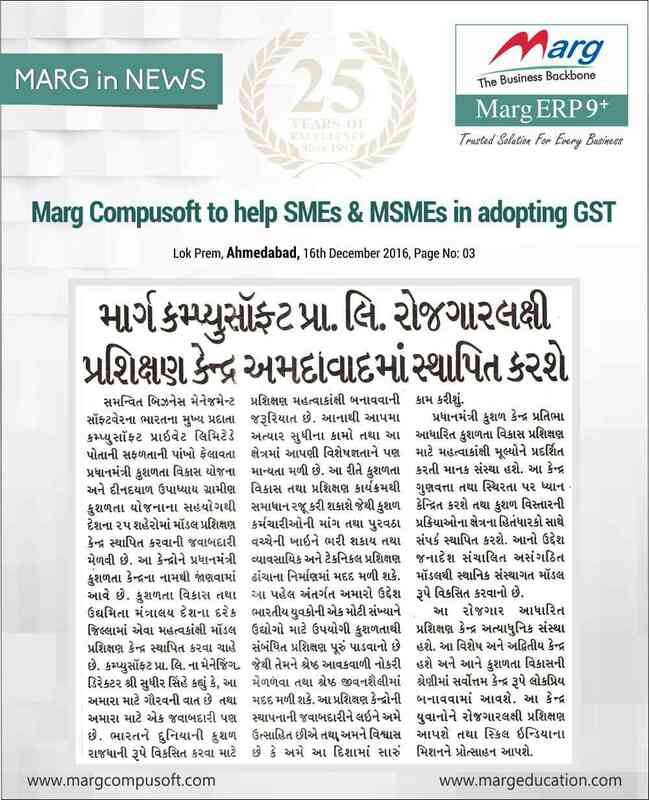 Marg ERP announces 'Project Vistaar' to assist MSMEs under new. 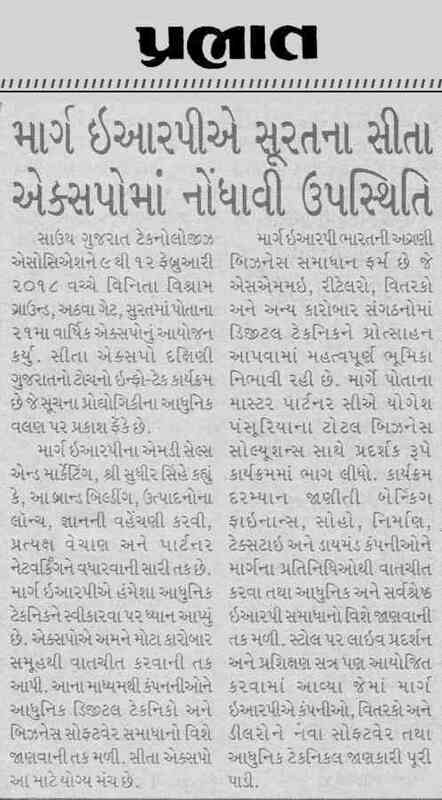 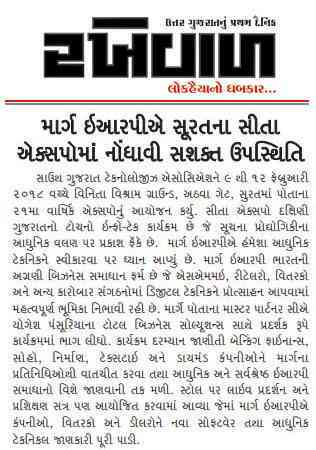 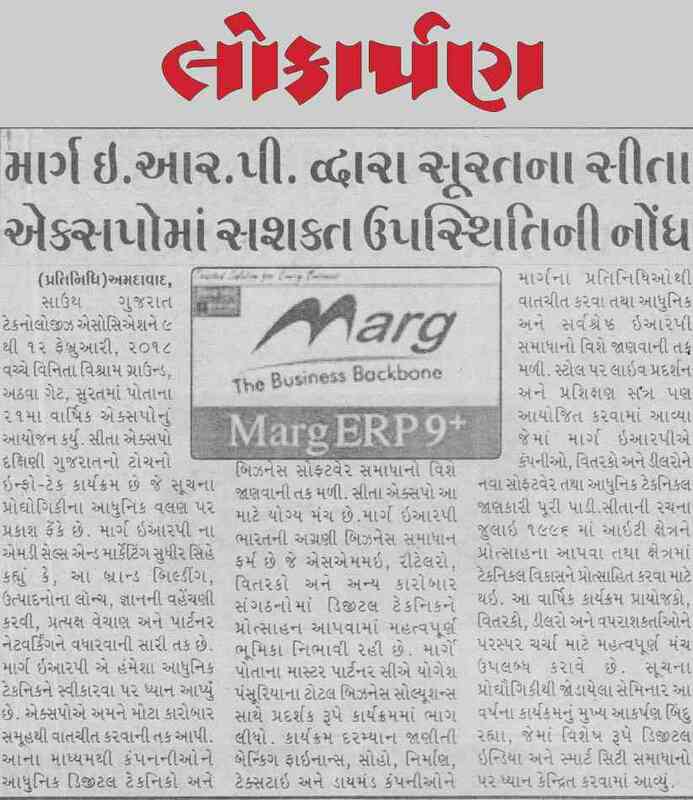 Marg ERP ne launch kiya Project Vistaar. 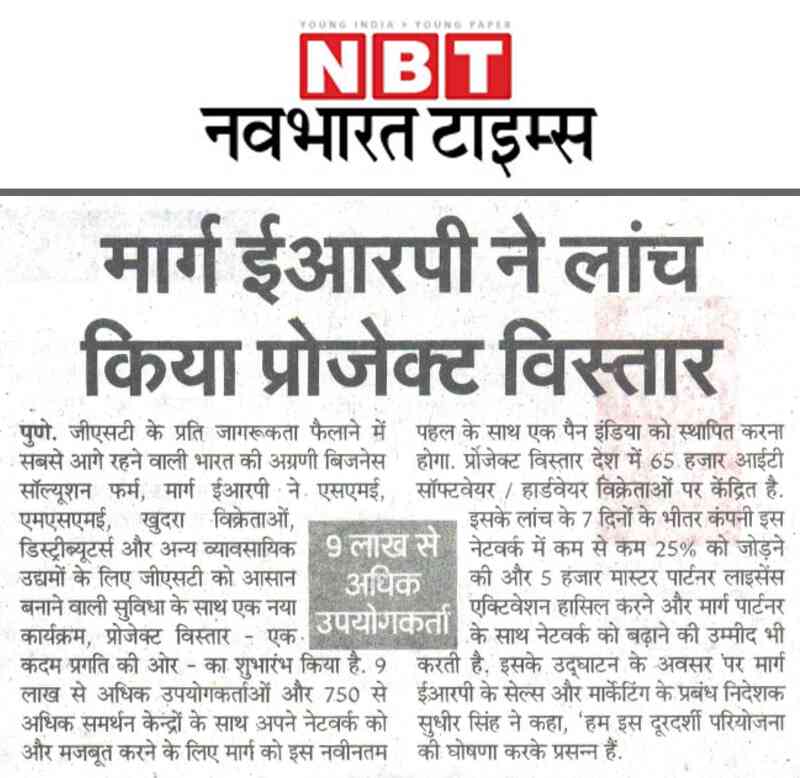 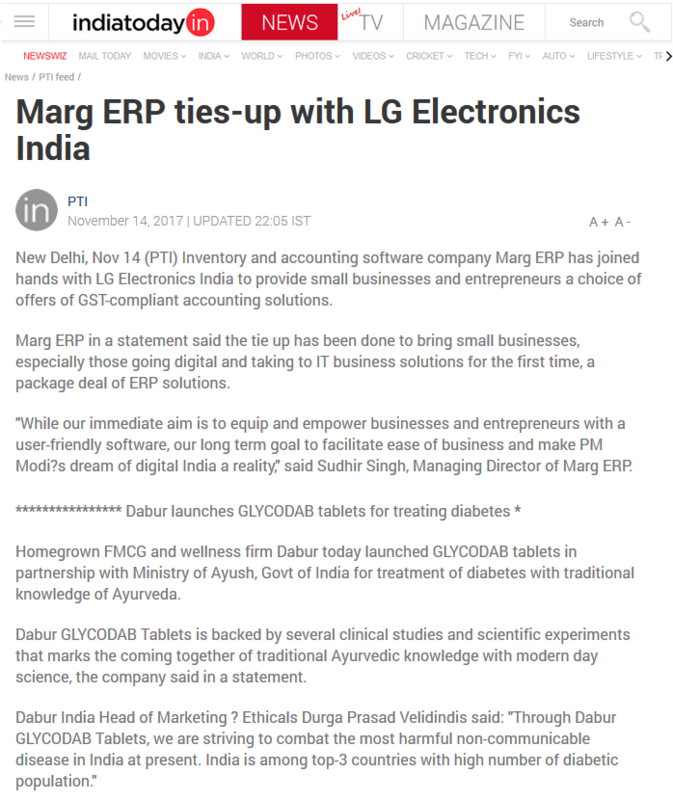 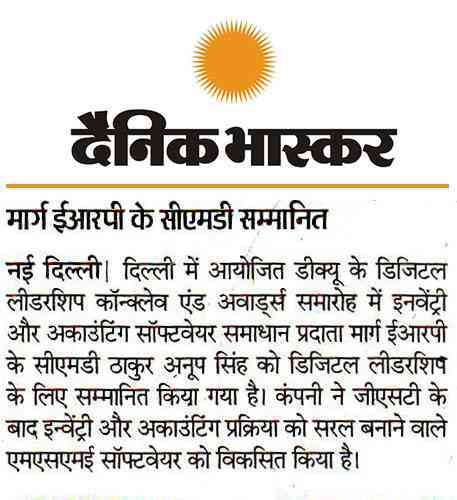 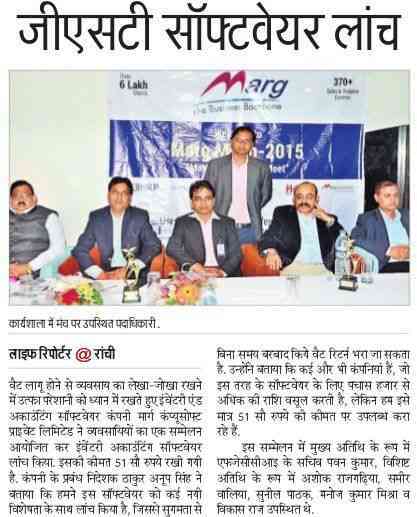 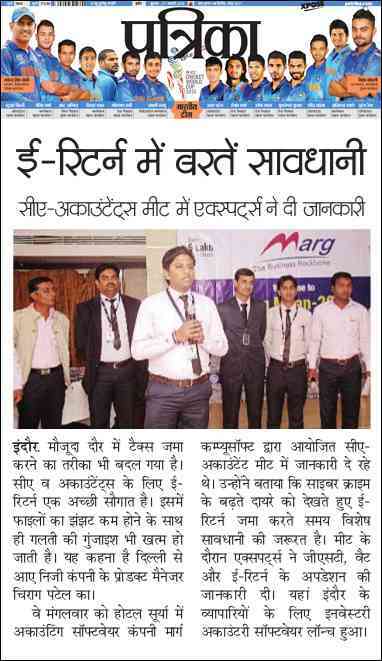 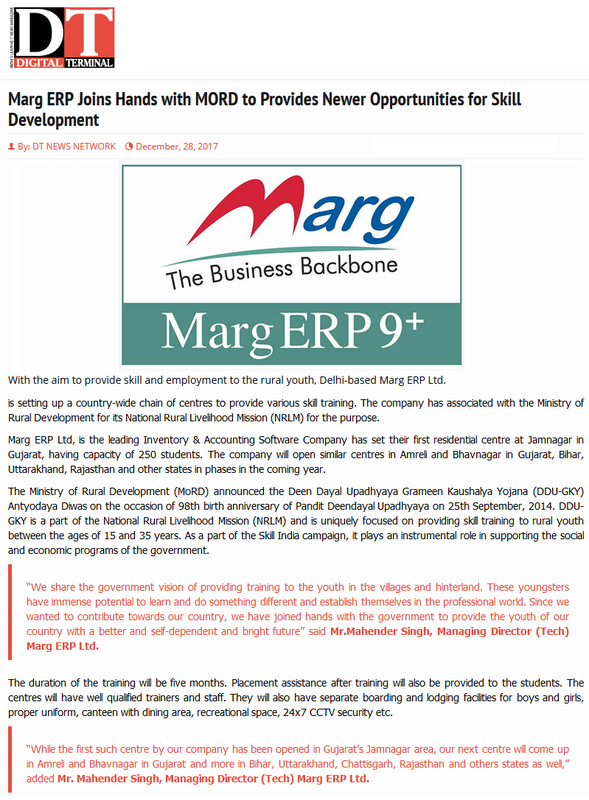 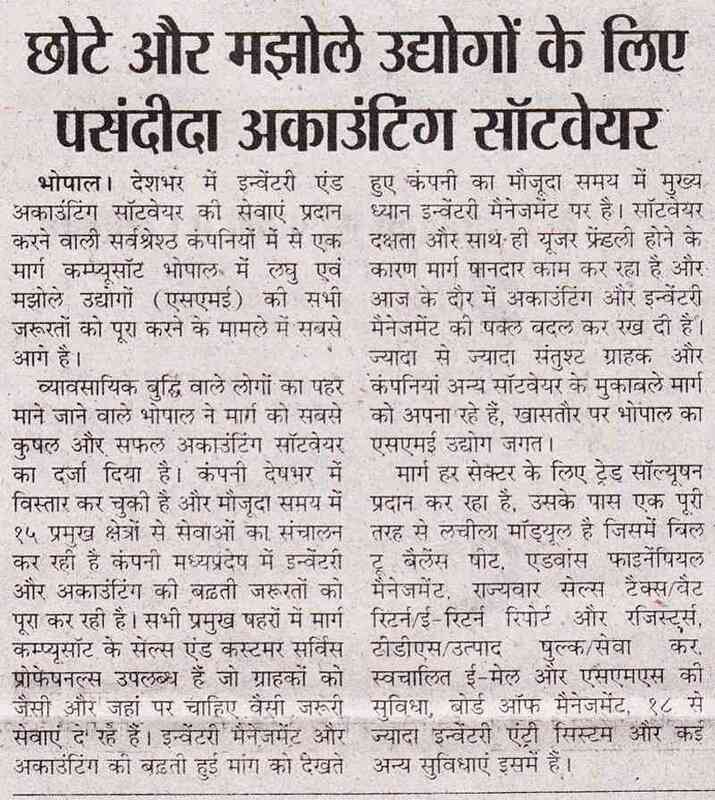 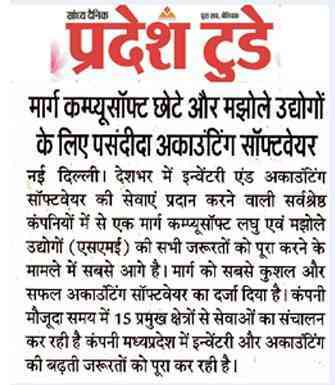 Marg ERP ties-up with LG Electronics India. 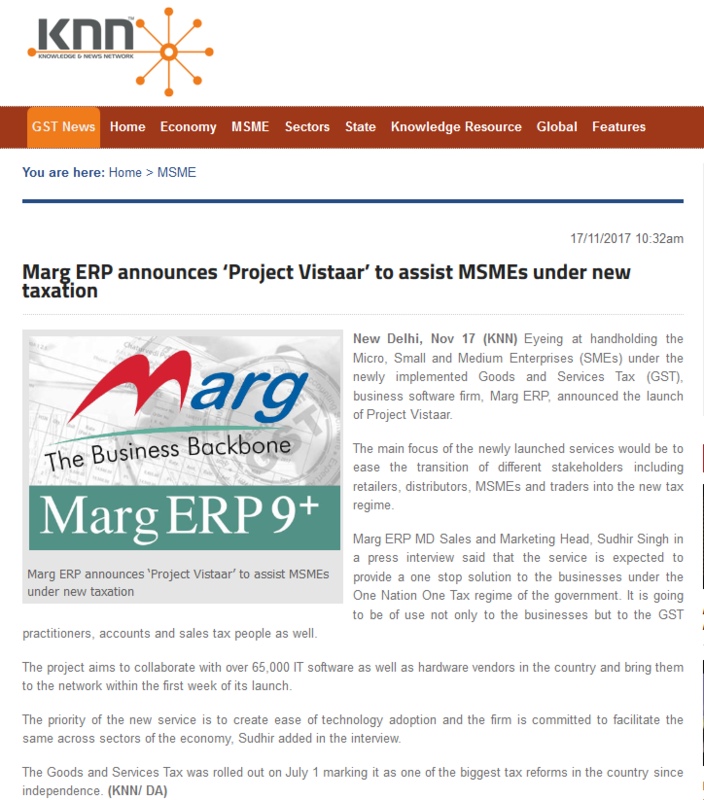 Marg ERP launched Project Vistaar to help SMEs. 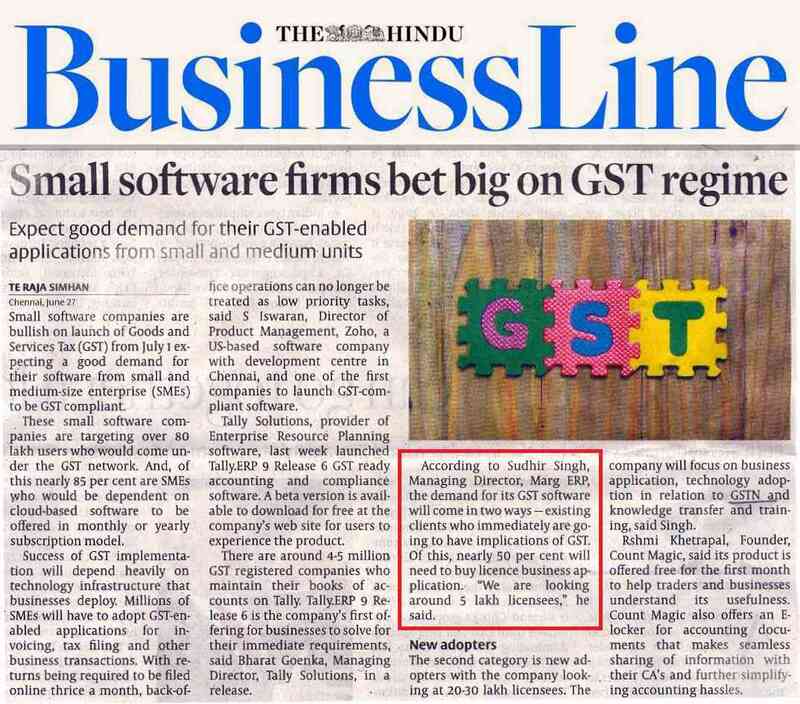 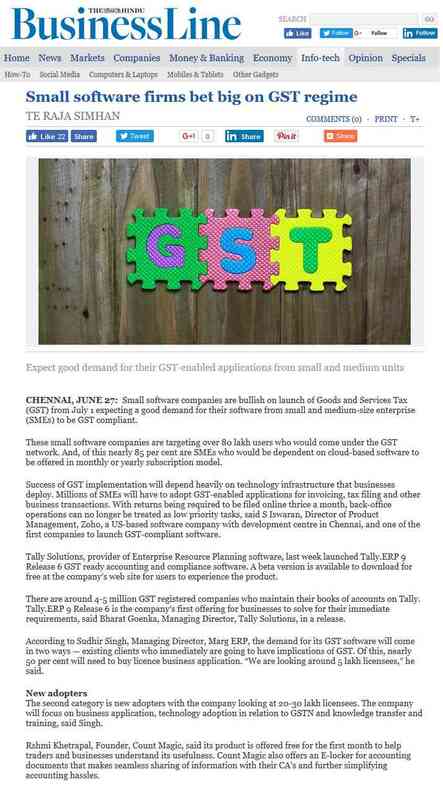 Small Software firms bet big on GST regime. 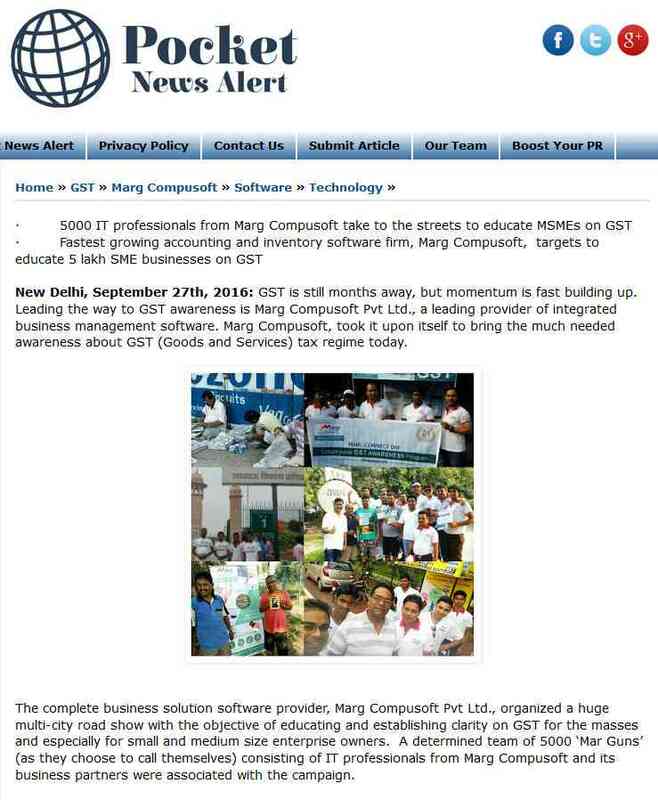 GST offers new opportunities for tax. 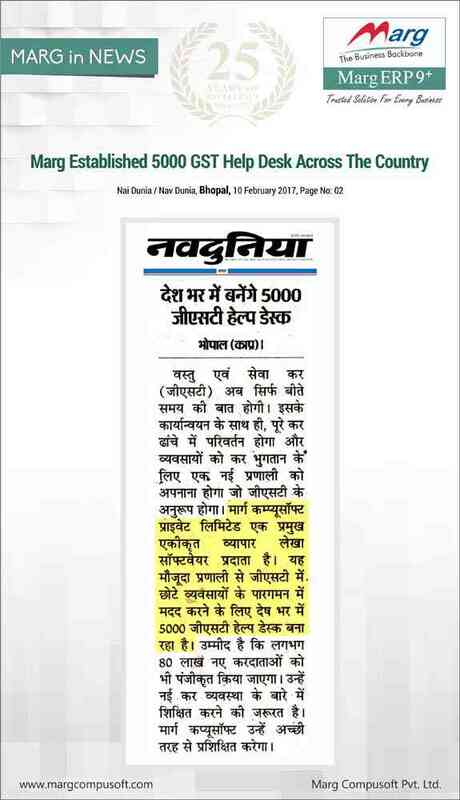 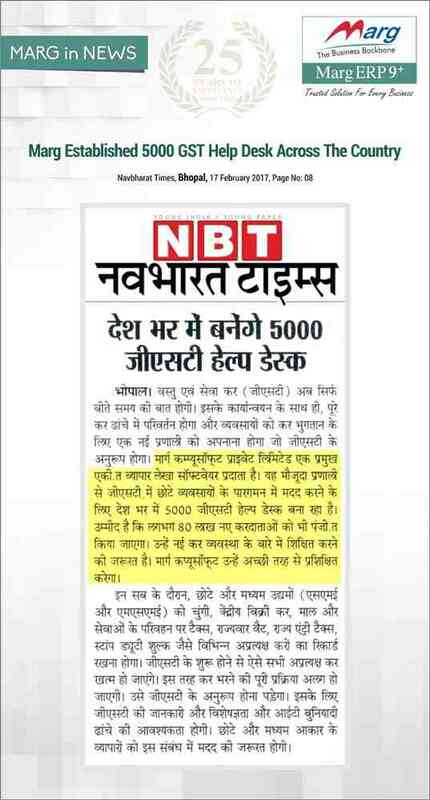 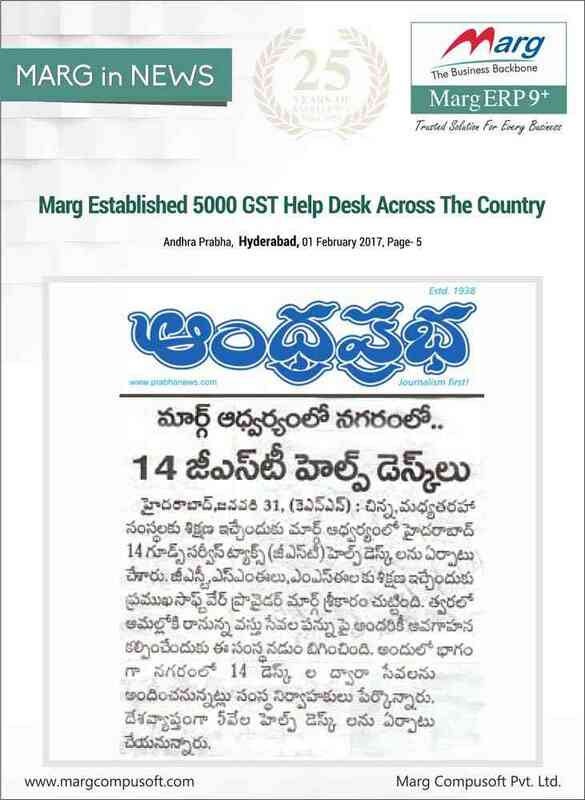 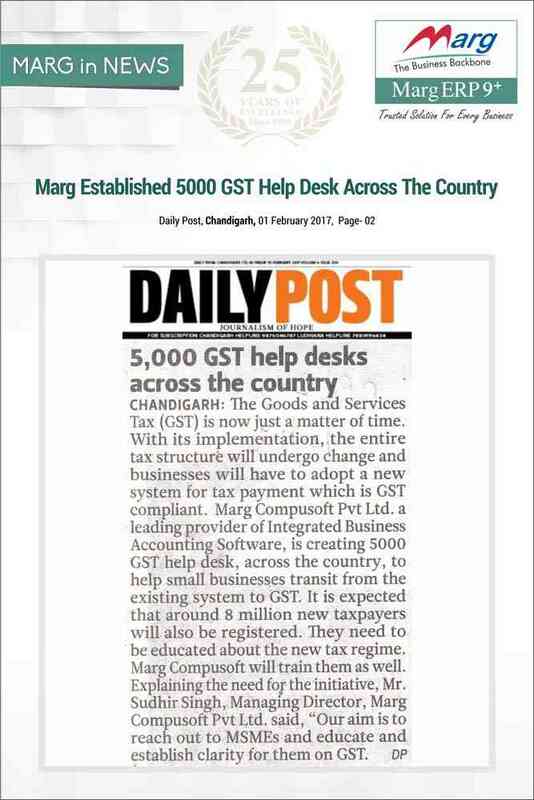 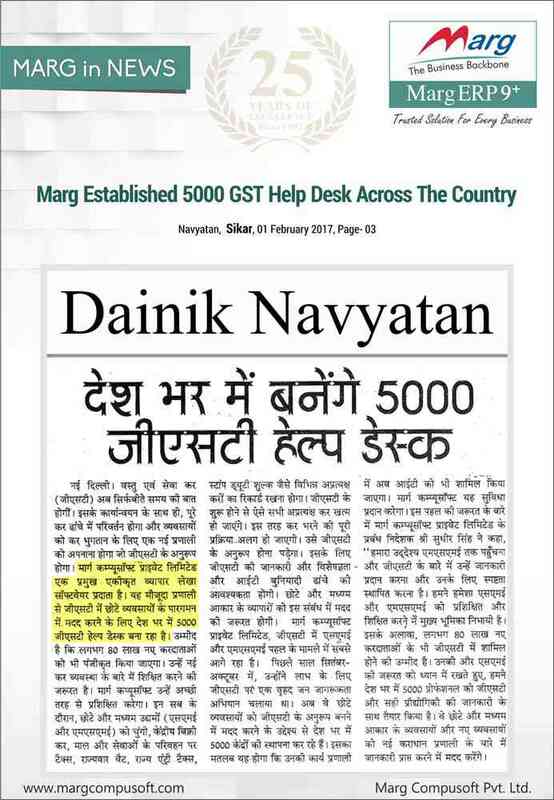 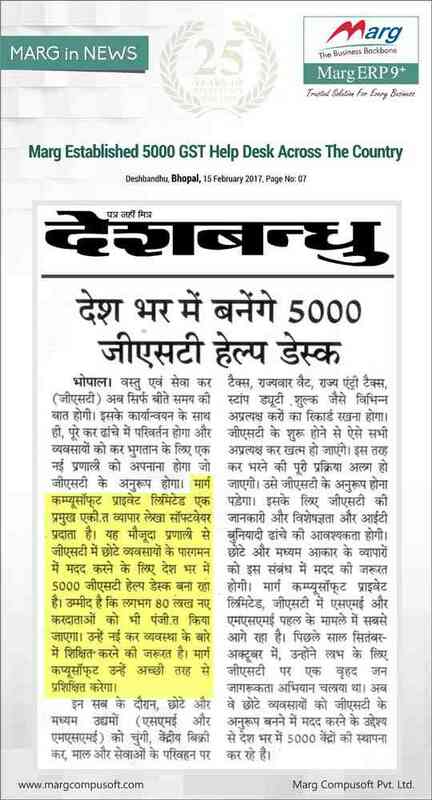 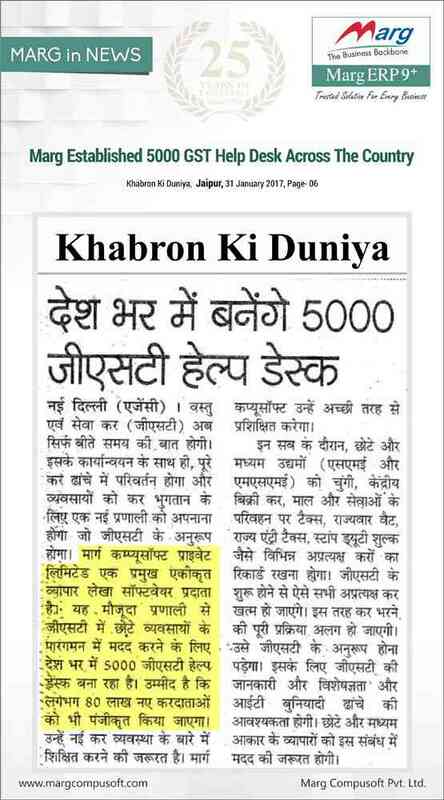 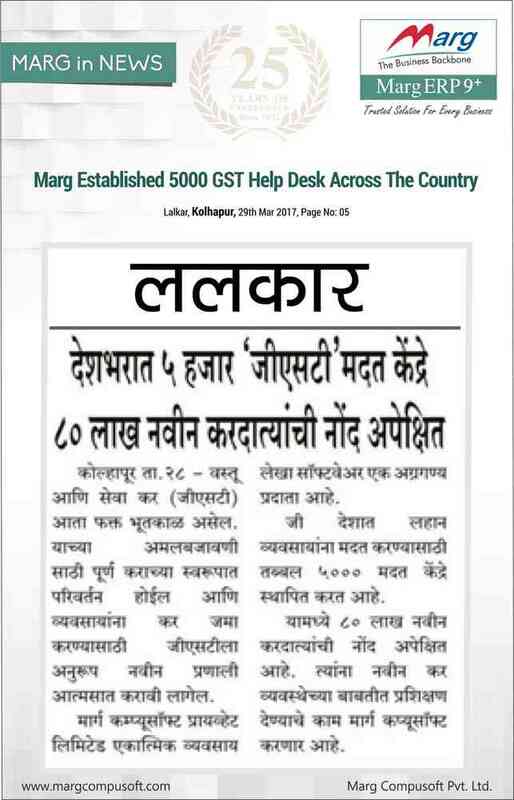 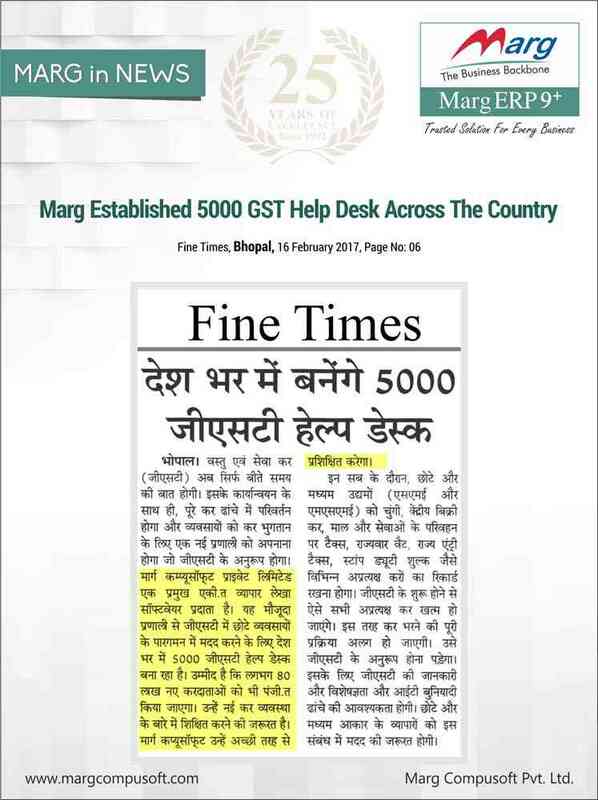 Marg Established 5000 GST Help Desk across the Country. 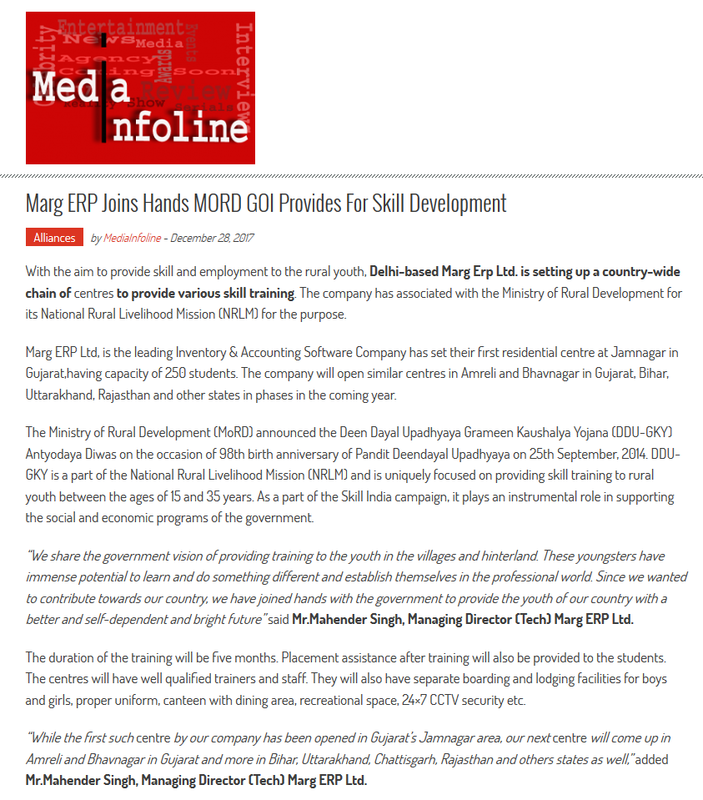 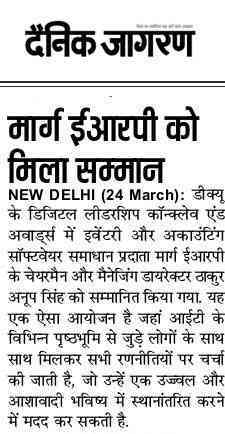 Marg Compusoft to Set Up Modal Training Centres. 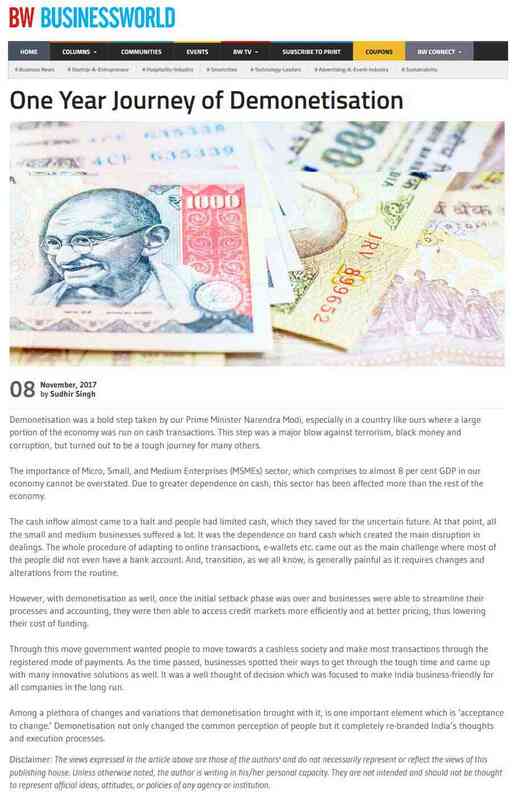 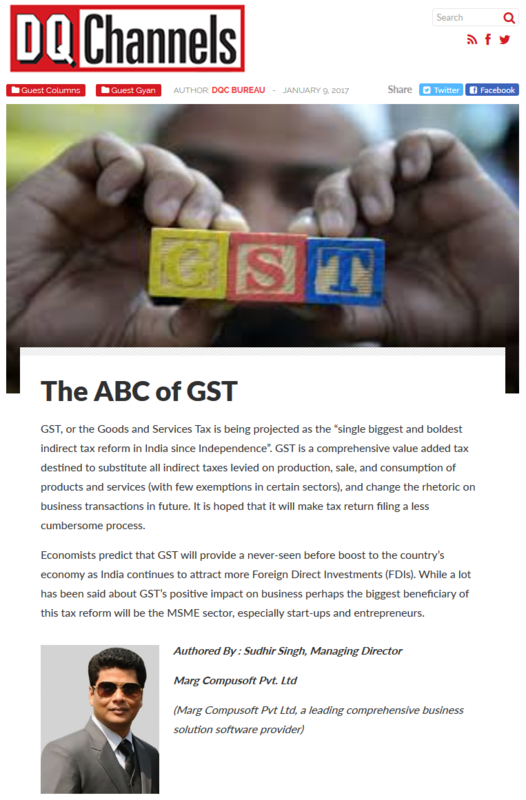 GST, or the Goods and Services Tax is being projected as the “single biggest and boldest indirect tax reform in India since Independence”. 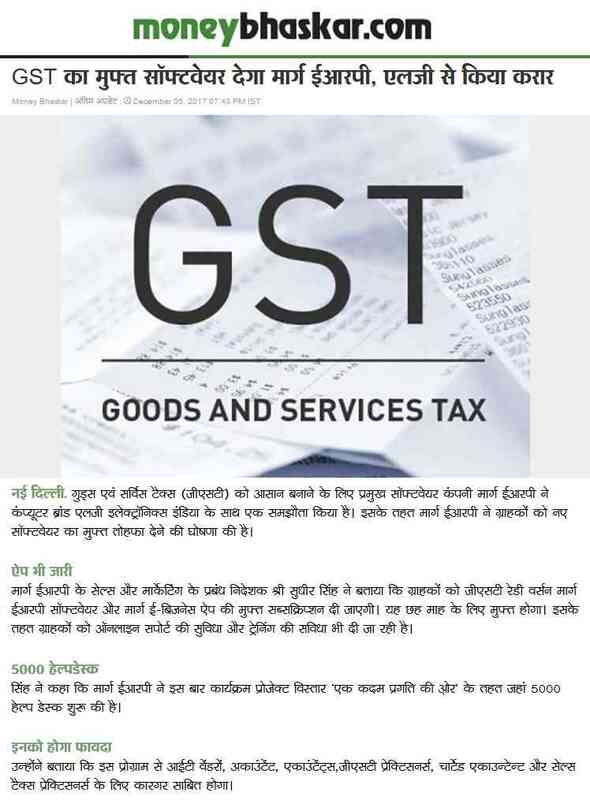 GST is a comprehensive value added tax destined to substitute all indirect taxes levied on production, sale, and consumption of products and services (with few exemptions in certain sectors), and change the rhetoric on business transactions in future. 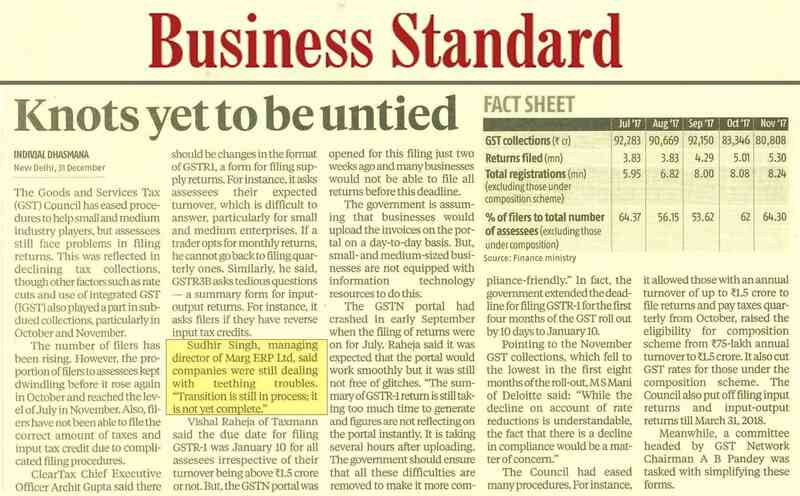 It is hoped that it will make tax return filing a less cumbersome process. 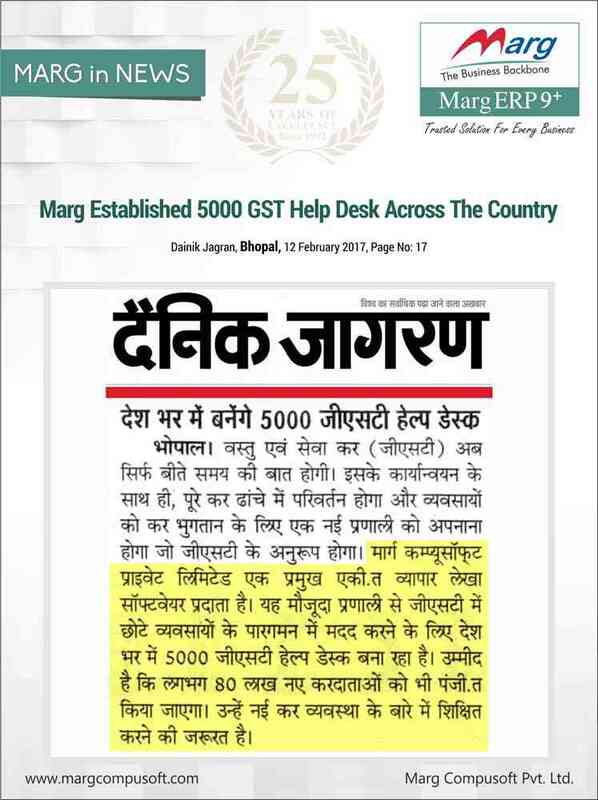 Year 2017 will be a big challenging year for all the companies as GST will be a beginning of new era in Indian tax history. 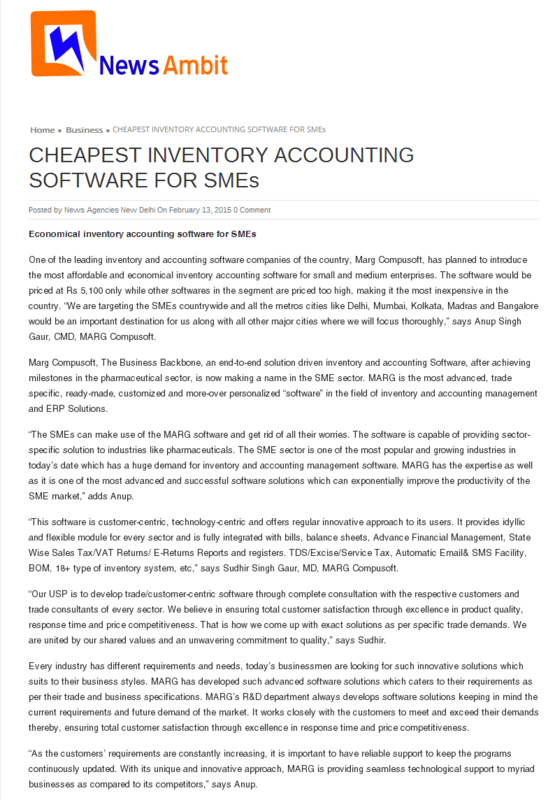 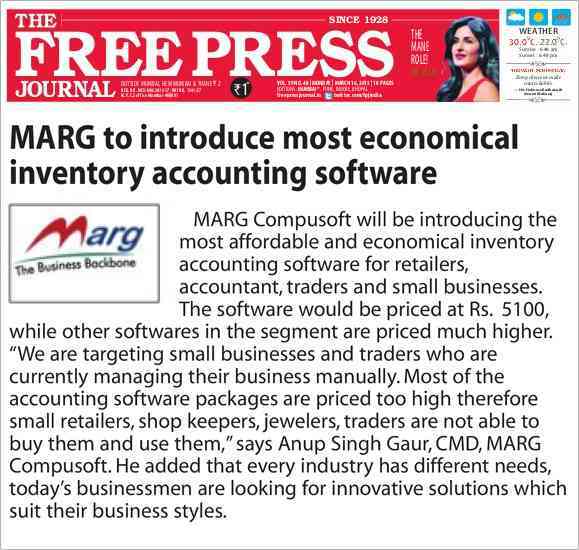 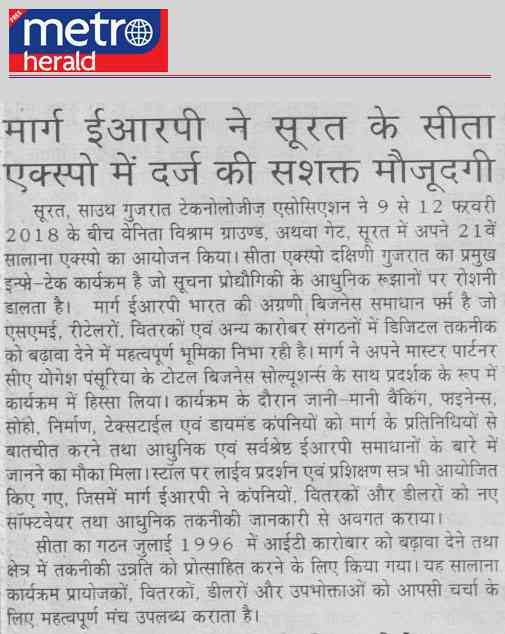 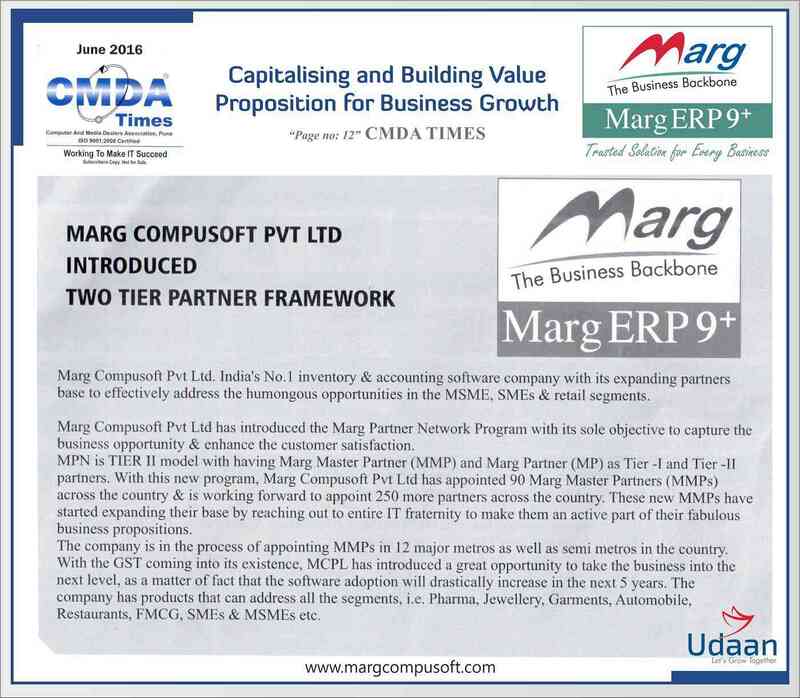 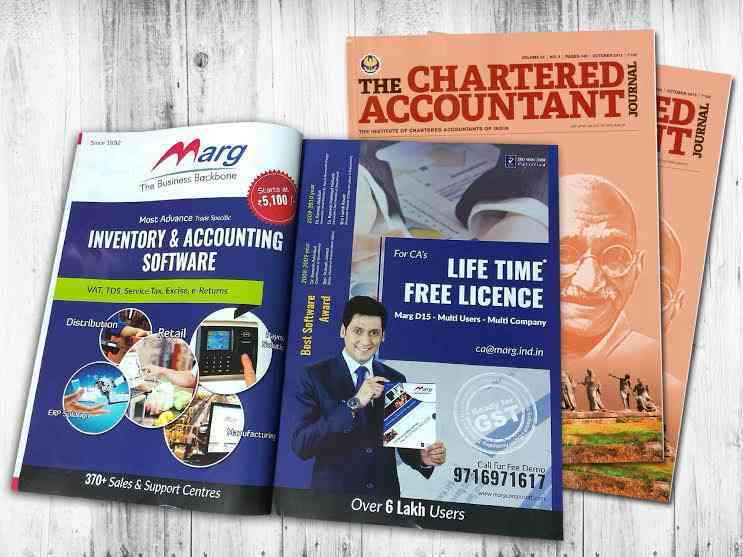 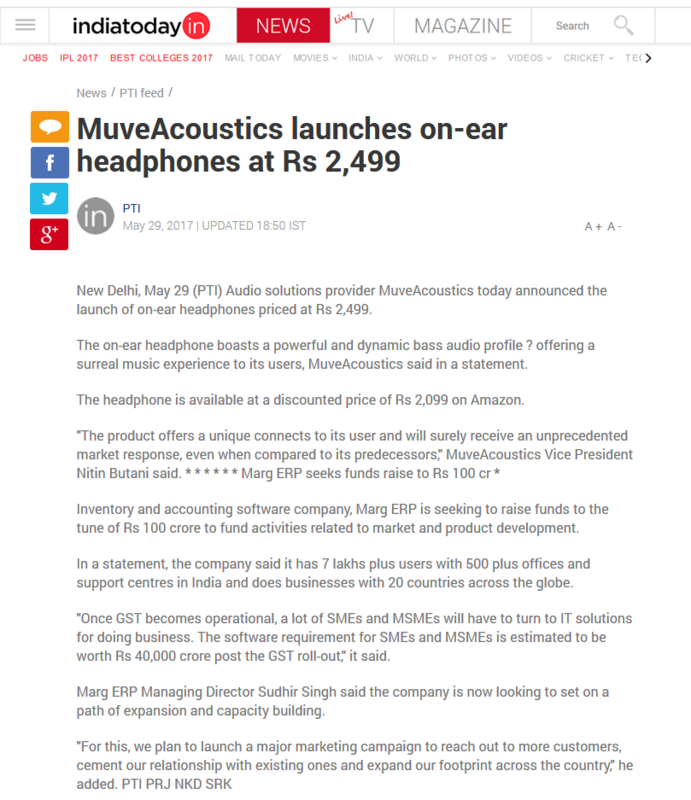 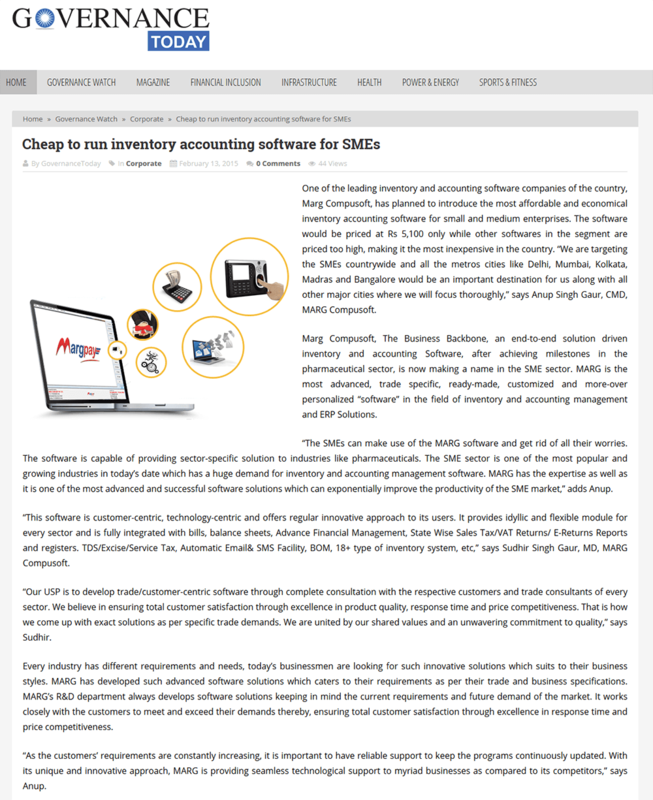 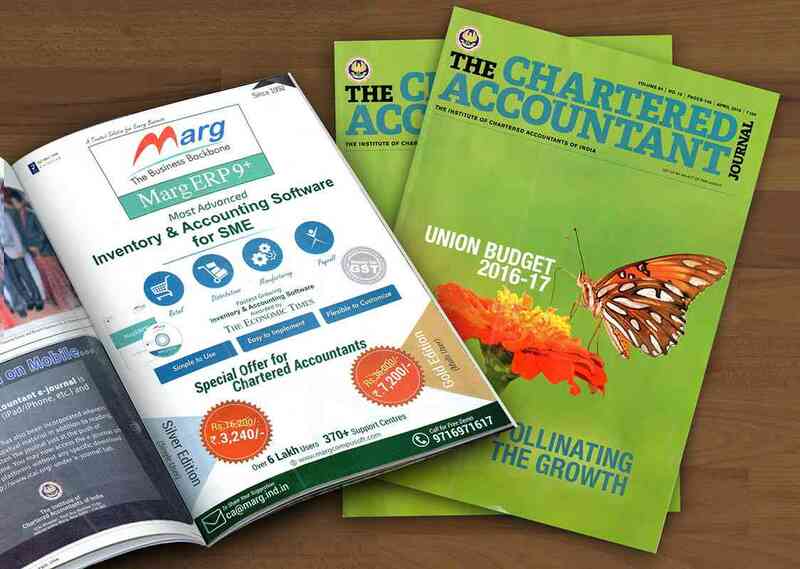 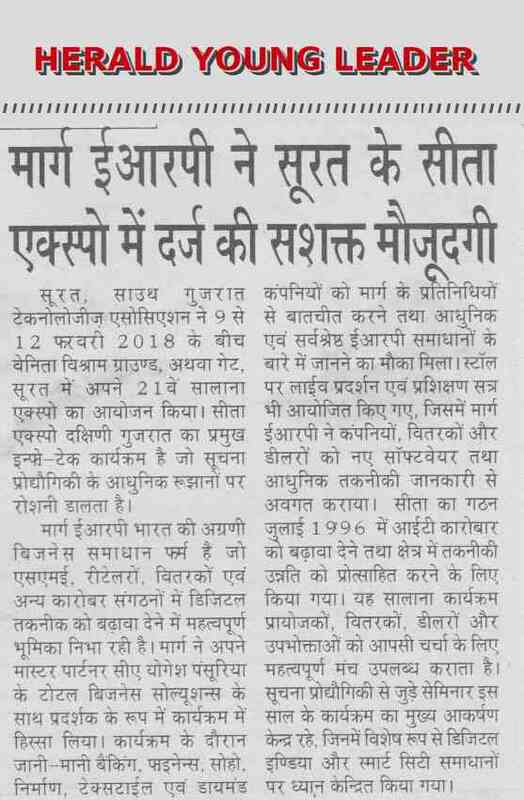 Government drive for its implementation has been intensified now.Accounting Software developer companies like Marg Compusoft will play major roles in its implication and also the new FY will bring lots of opportunities and challenges for them. 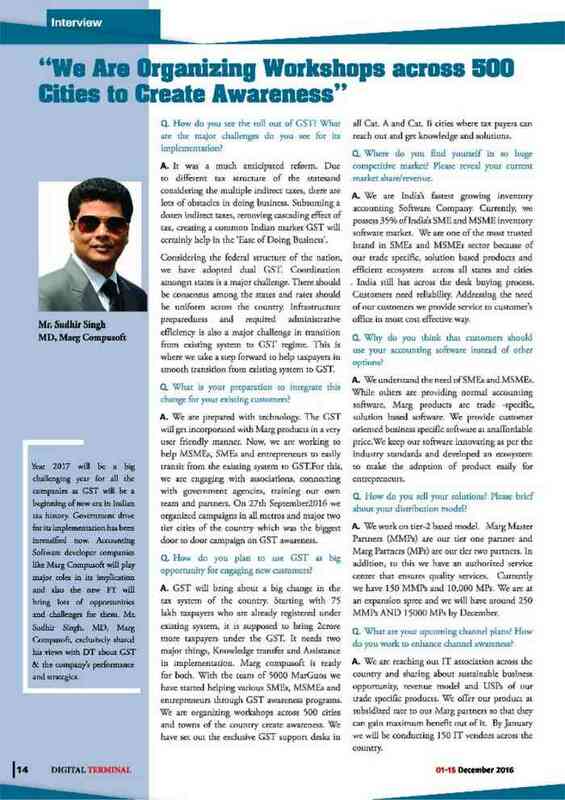 Mr. Sudhir Singh, MD, Marg Compusoft, exclusively shared his views with DT about GST & the company’s performance and strategies. 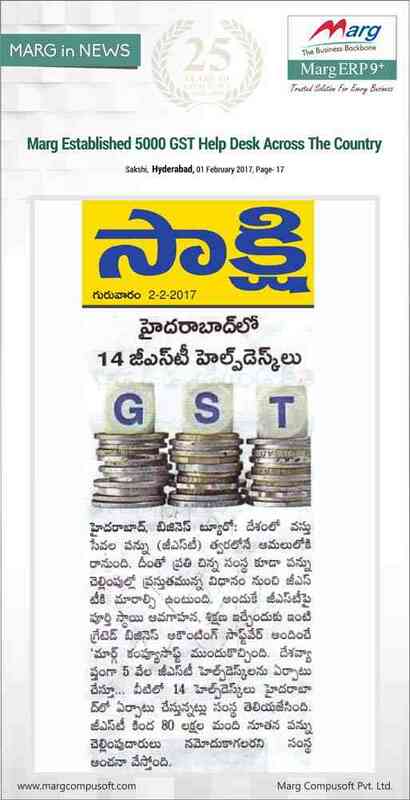 GST is still months away, but momentum is fast building up. 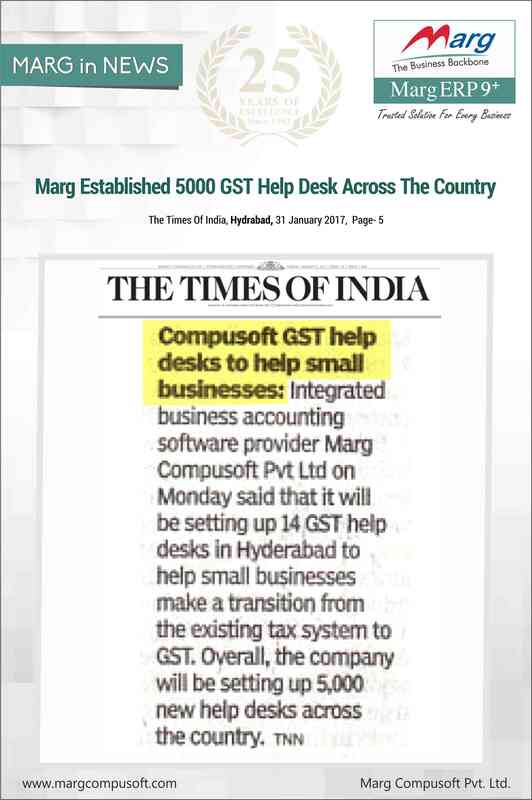 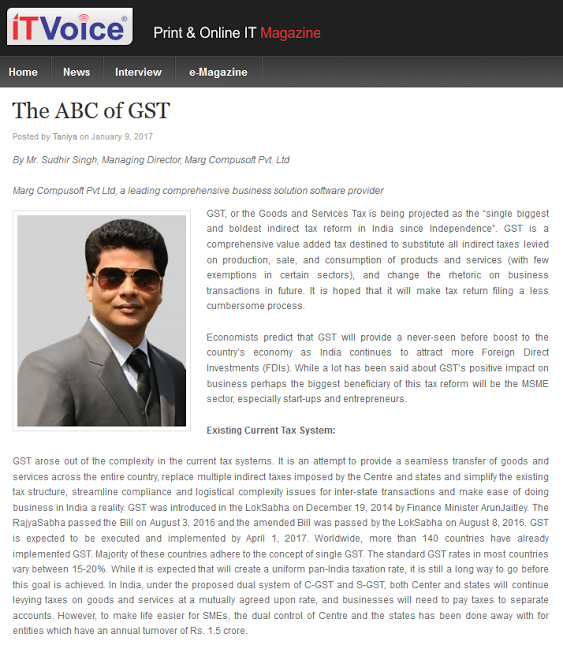 Leading the way to GST awareness is Marg Compusoft Pvt Ltd., a leading provider of integrated business management software. 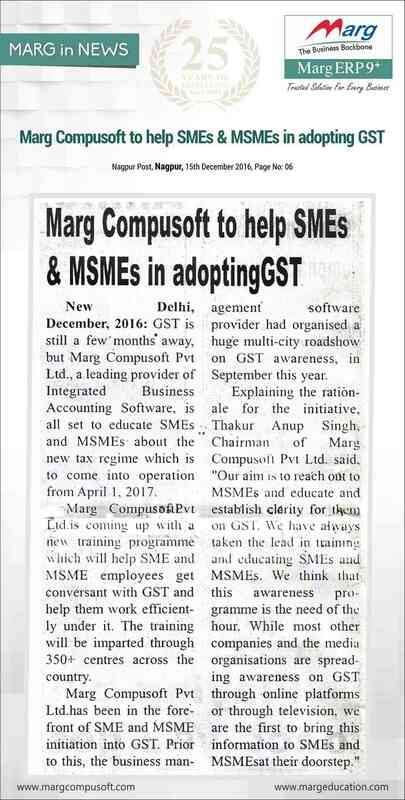 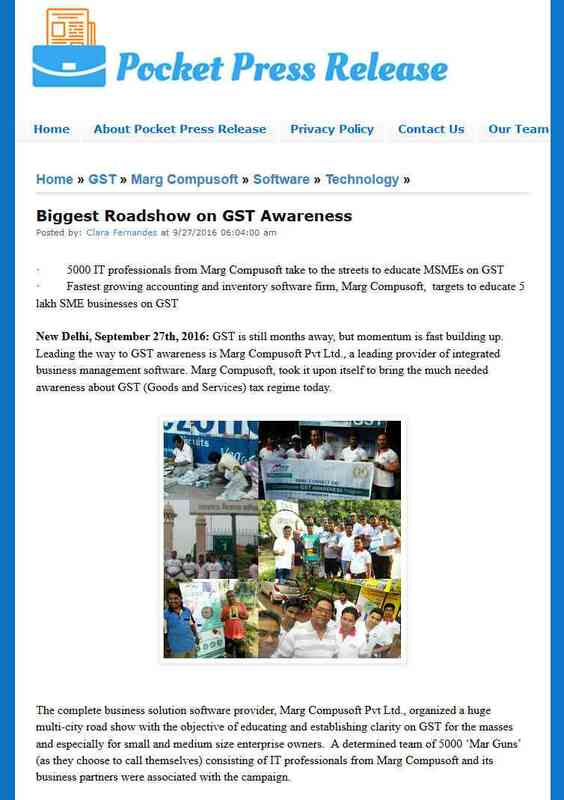 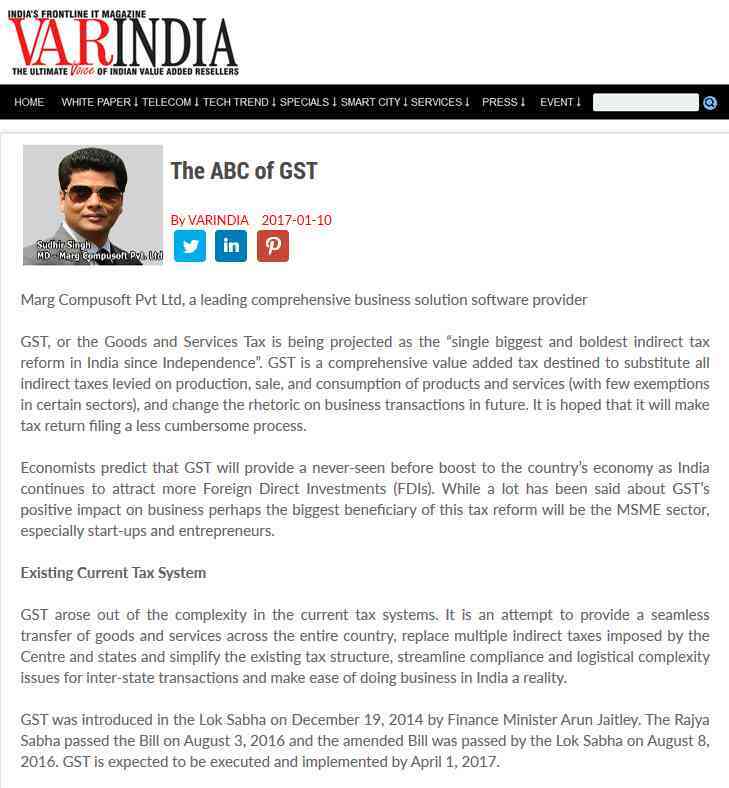 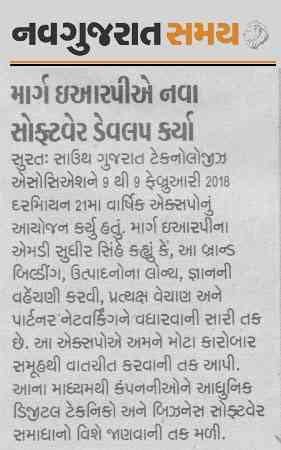 Marg Compusoft, took it upon itself to bring the much needed awareness about GST (Goods and Services) tax regime today. 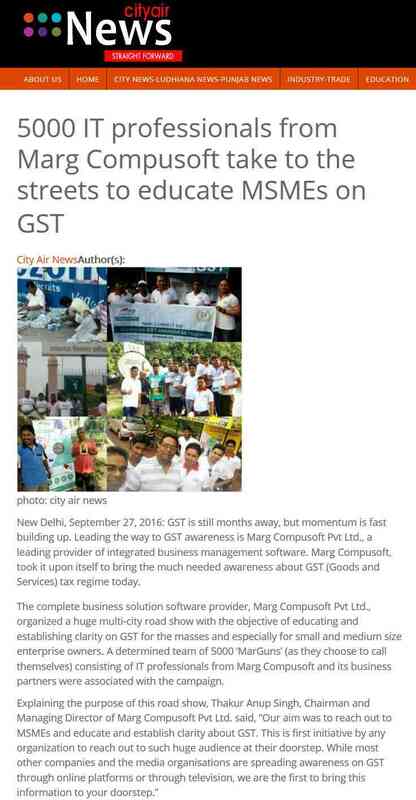 GST is still months away, but momentum is fast building up. 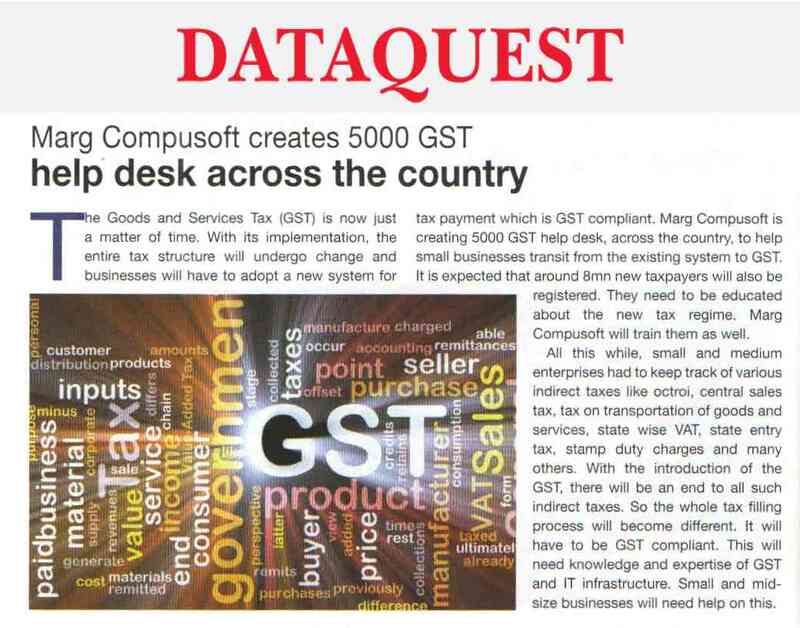 Leading the way to GST awareness is Marg Compusoft Pvt Ltd., a leading provider of integrated business management software. 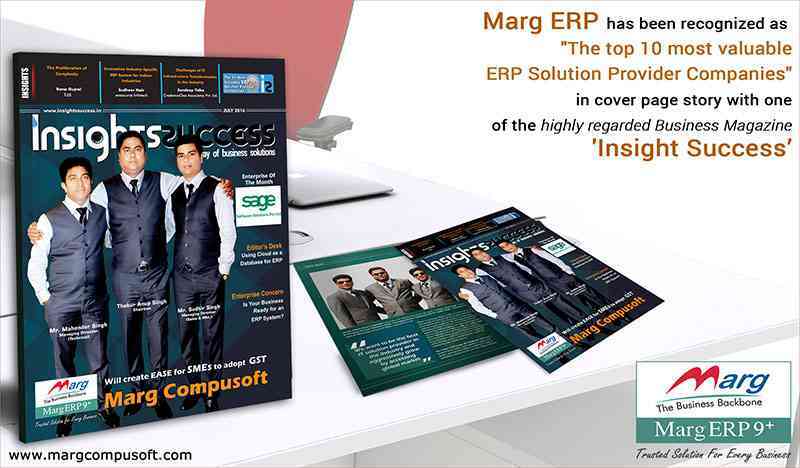 We are pleased to announce that Marg Compusoft has been recognized in the list of the 10 most valuable ERP Solution Provider Companies by Insights Success Magazine one of the highly regarded Business Magazine in the world for the enterprisers being the prime source of business insights for both technology and business updates that is currently ruling the business world. 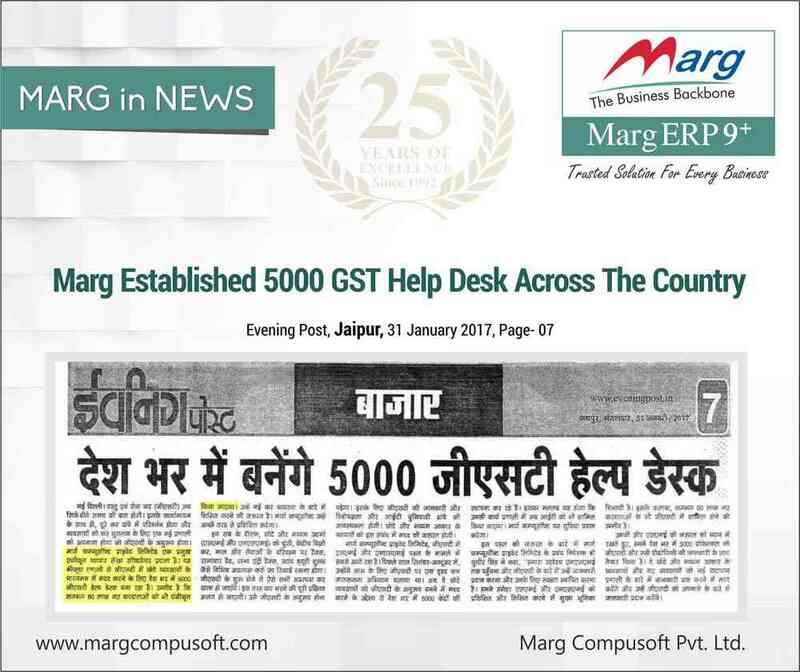 It is truly the result of the hard-work, dedication and never-say-no spirit that Marg have invested in working day & night towards this another great milestone. 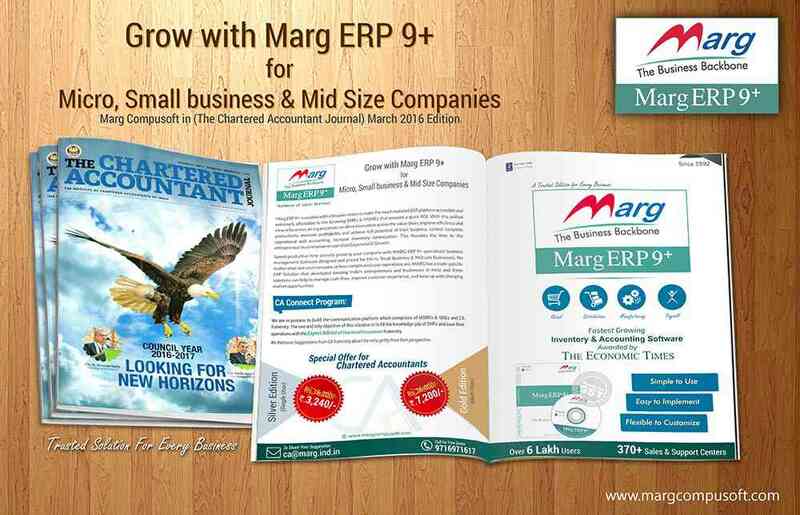 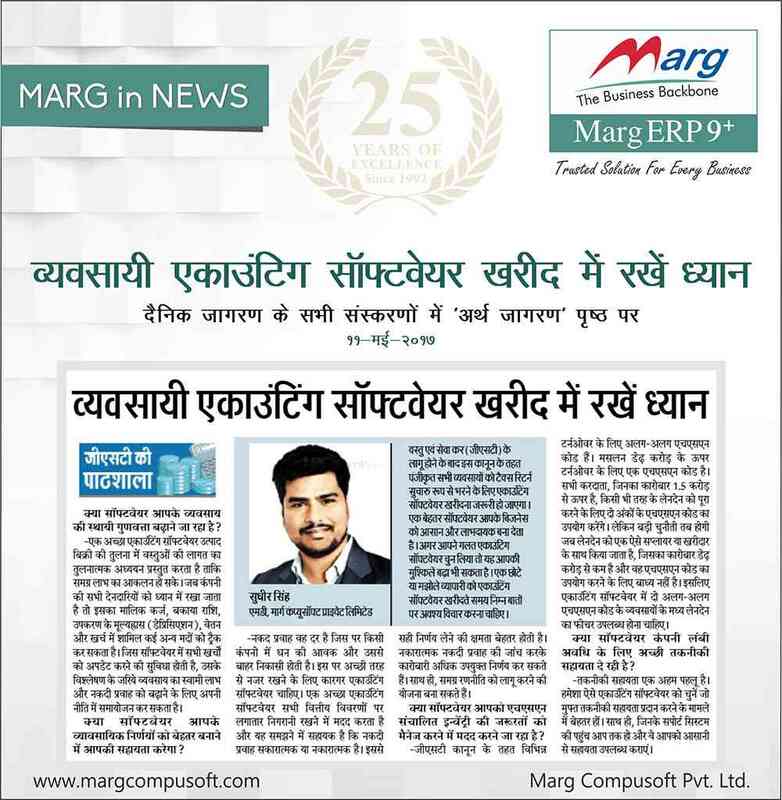 Marg has been accredited as one of the top 10 fastest growing ERP Solution Providers of 2016 for creating innovations and promoting technology excellence within the various industries. 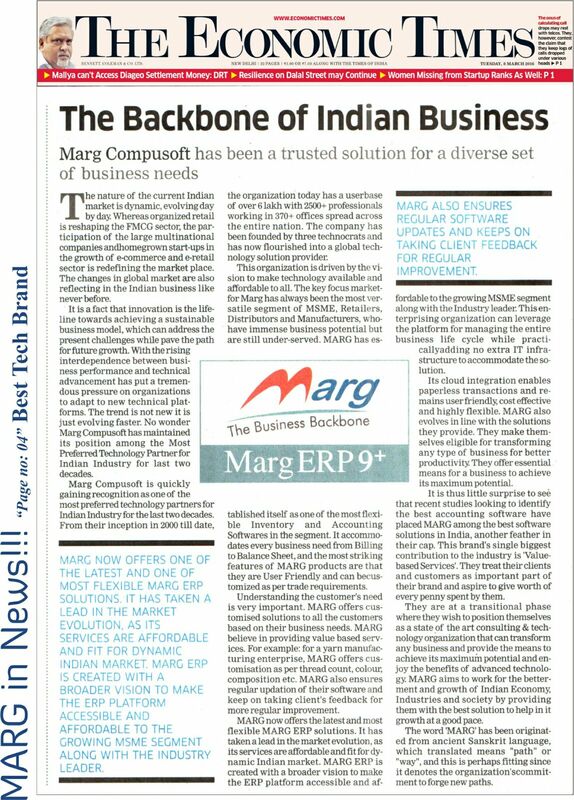 Marg is also moving ahead uninterruptedly on its path of success with a lot of plans and products from future perspective. 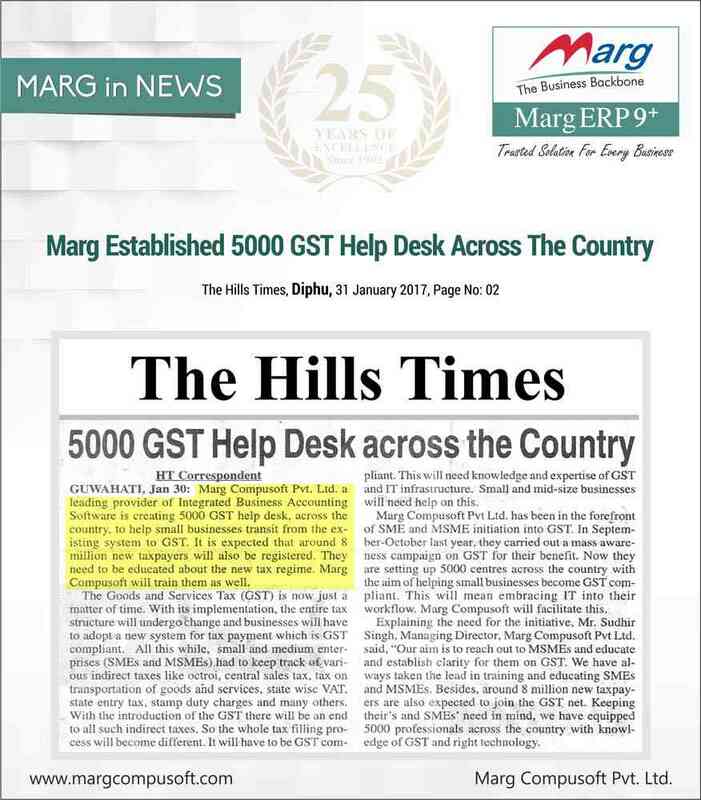 We appreciate the efforts and contribution of each of our Marg users, partners & team members for achieving this accreditation. 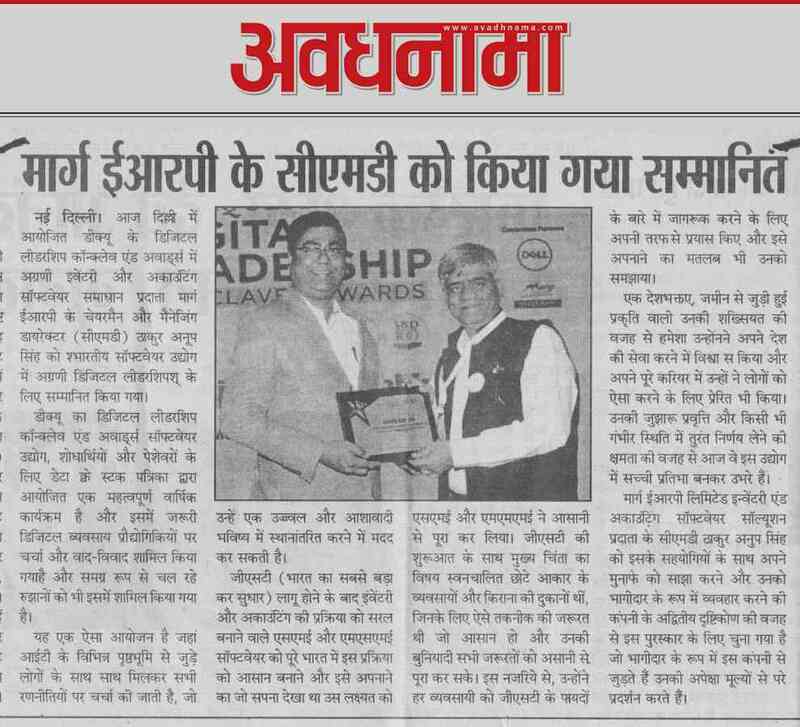 It is an important accomplishment in which we should all take pride and embrace the tomorrow with an exquisite ease & confidence. 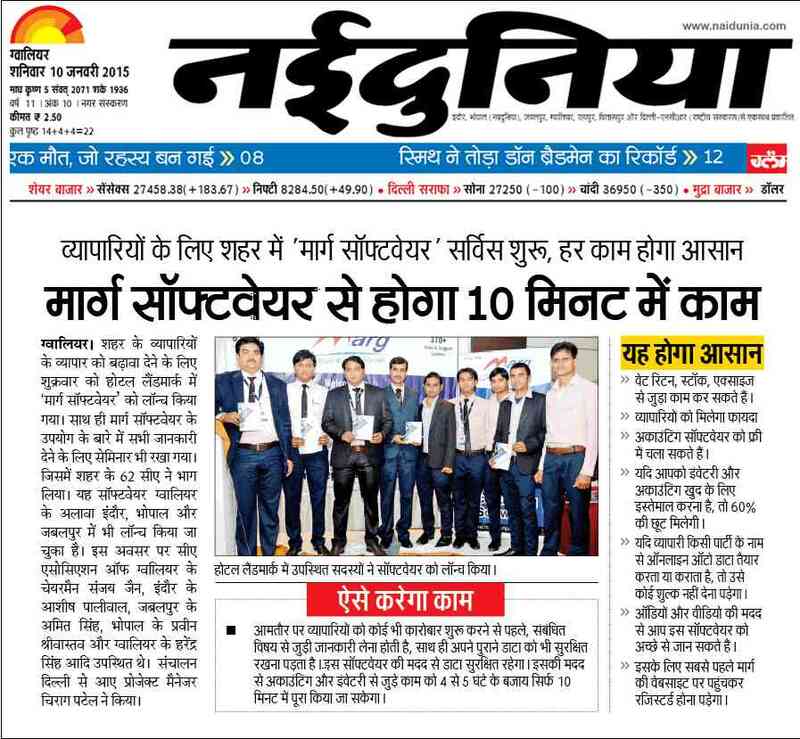 We once again thank you all for your ongoing support and sincerely look forward to sharing many more success stories like this great milestone in the future endeavors. 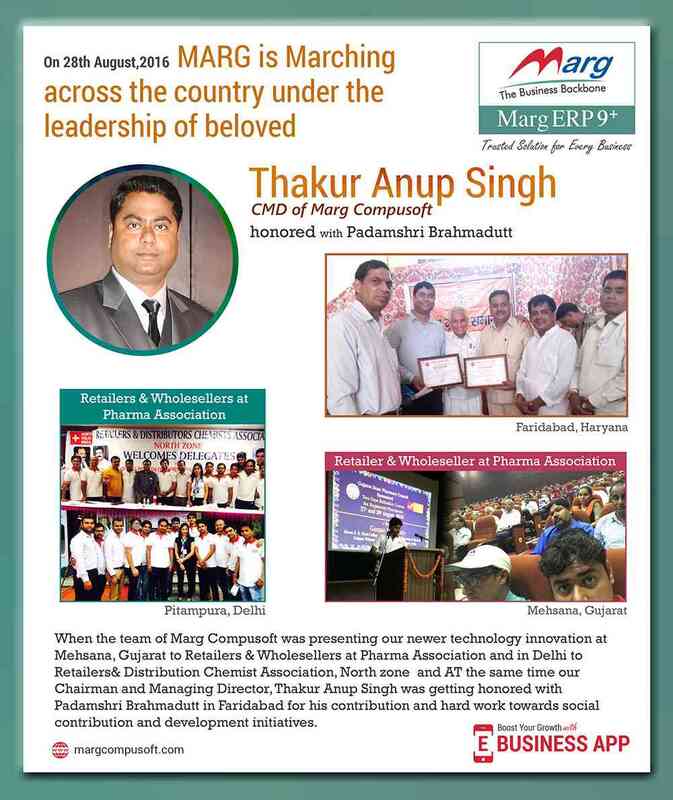 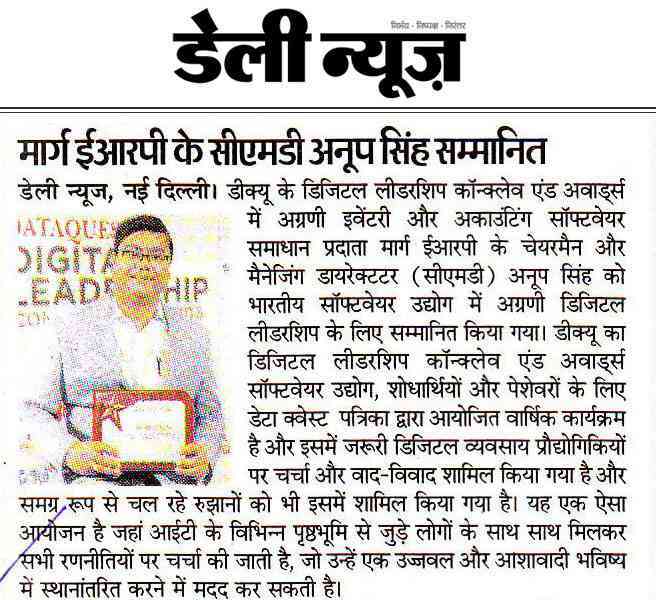 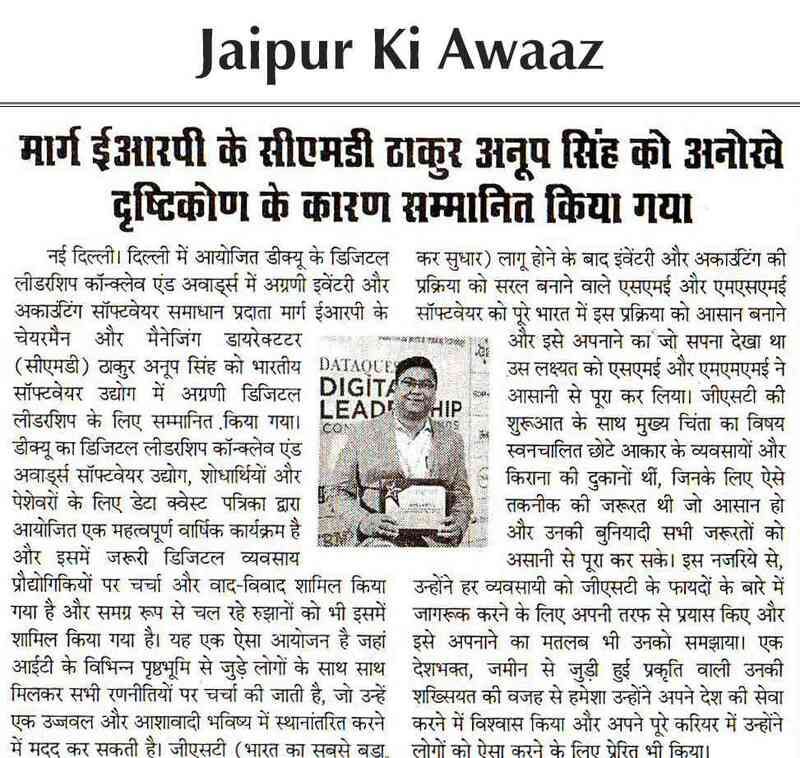 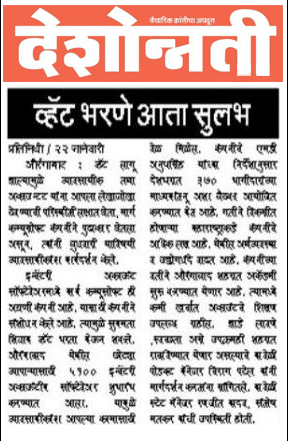 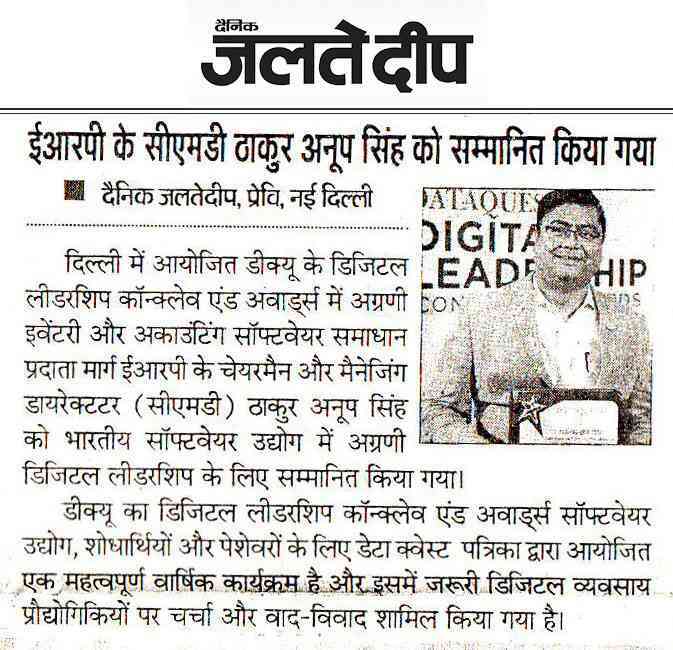 It's because of true & great leadership of our honorable CMD, Shri Thakur Anup Singh that on 28th August 2016, Marg Compusoft Pvt. 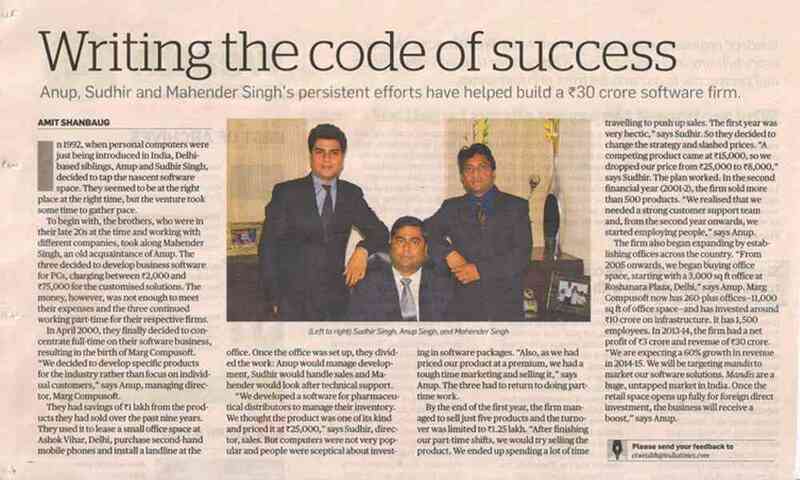 Ltd. created its remarkable & significant presence in 2 different cities i.e. 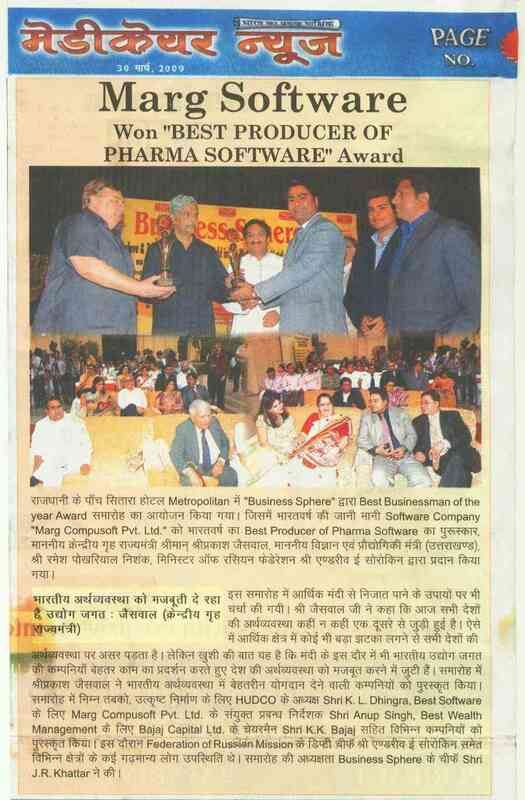 Delhi and Gujrat at Retail & Wholeseller Pharma Association meet towards the newer innovation in technology -Marg ERP 9+ integrated with eBusiness app. 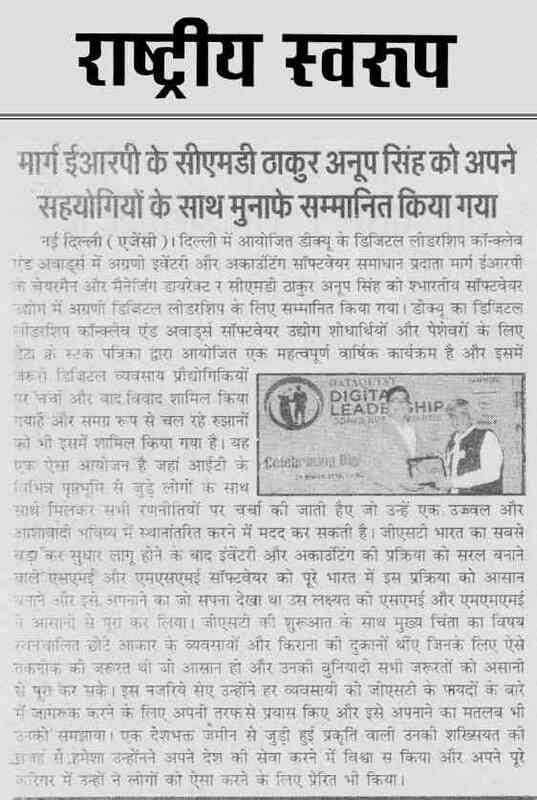 On the same time, Shri Thakur Anup Singh was also getting honored with Padamshri Bramadutt in Faridabad for his contribution into social development initiatives. 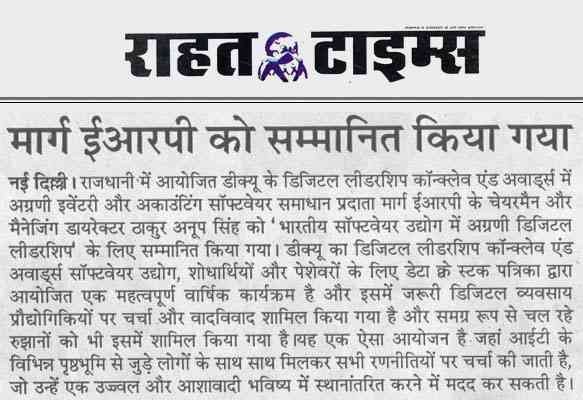 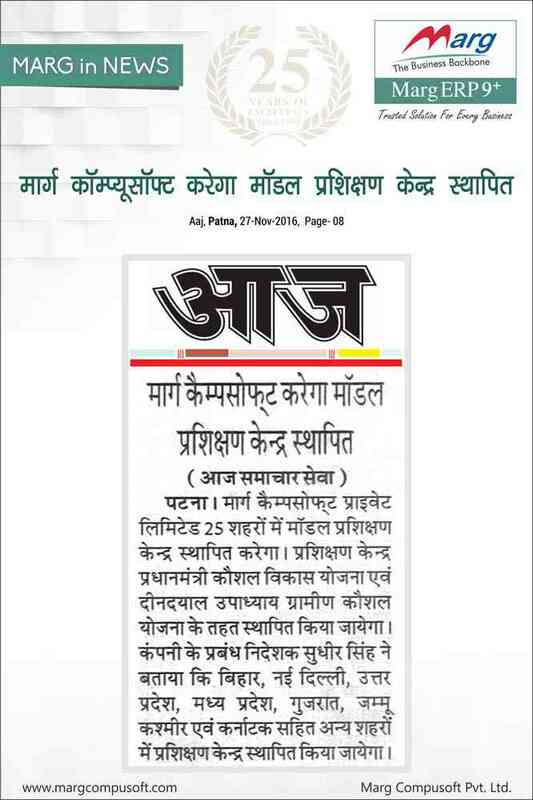 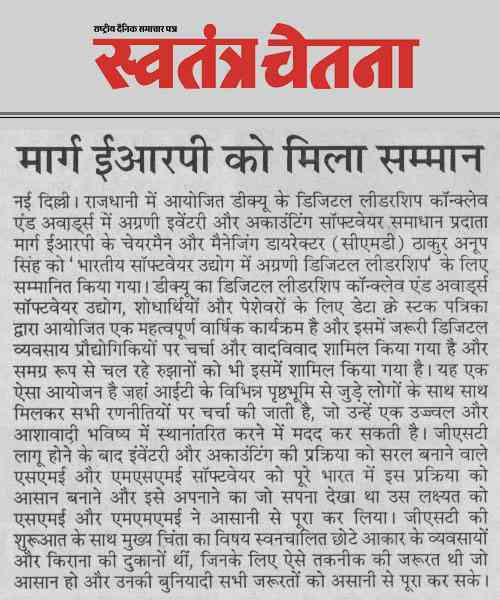 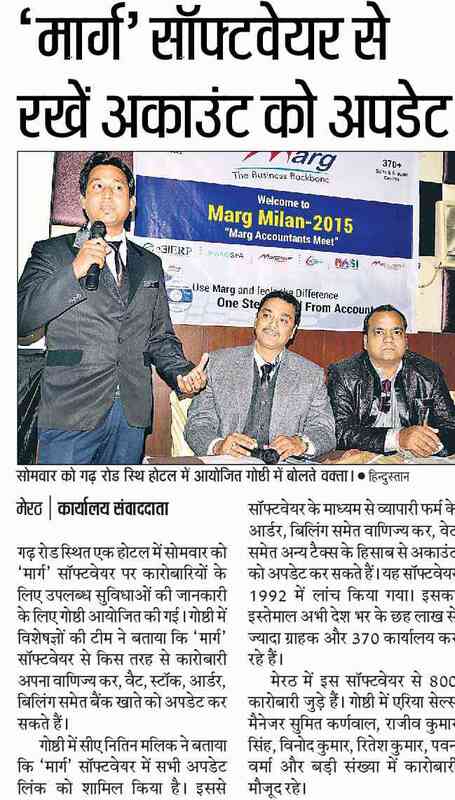 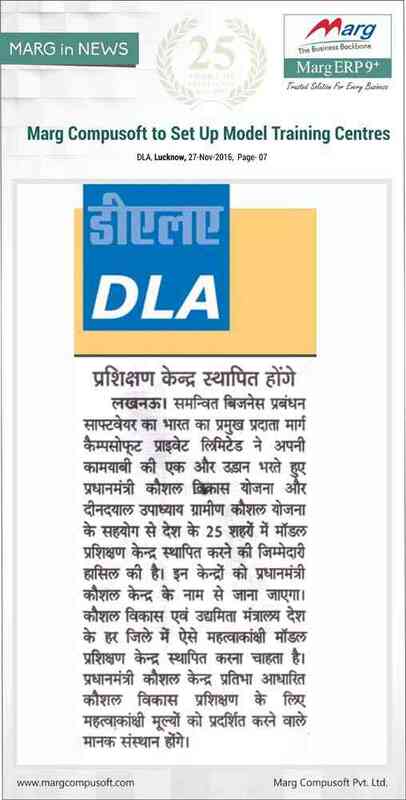 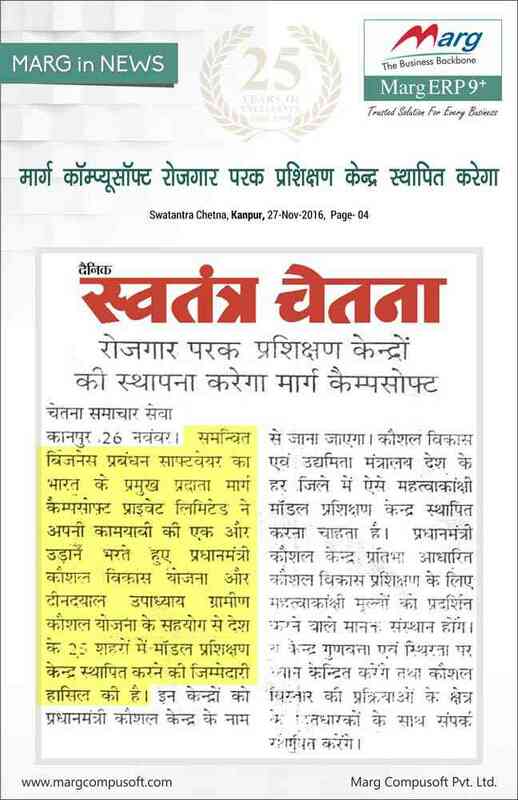 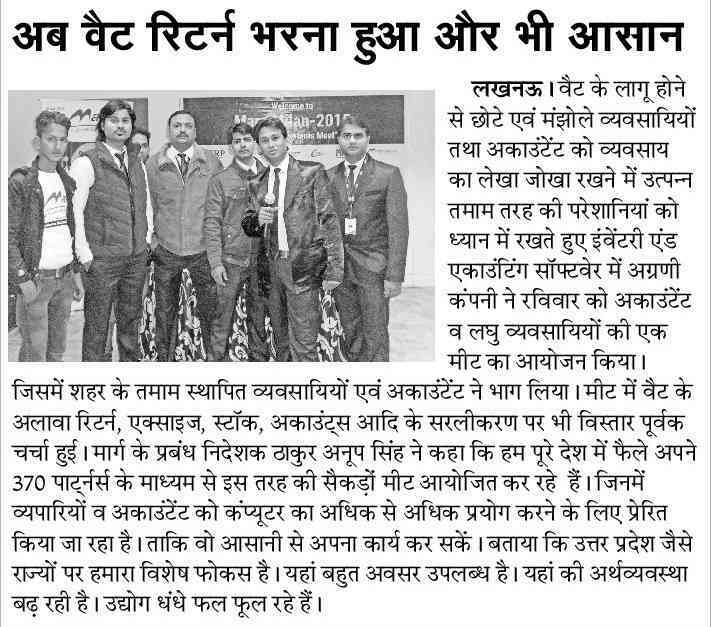 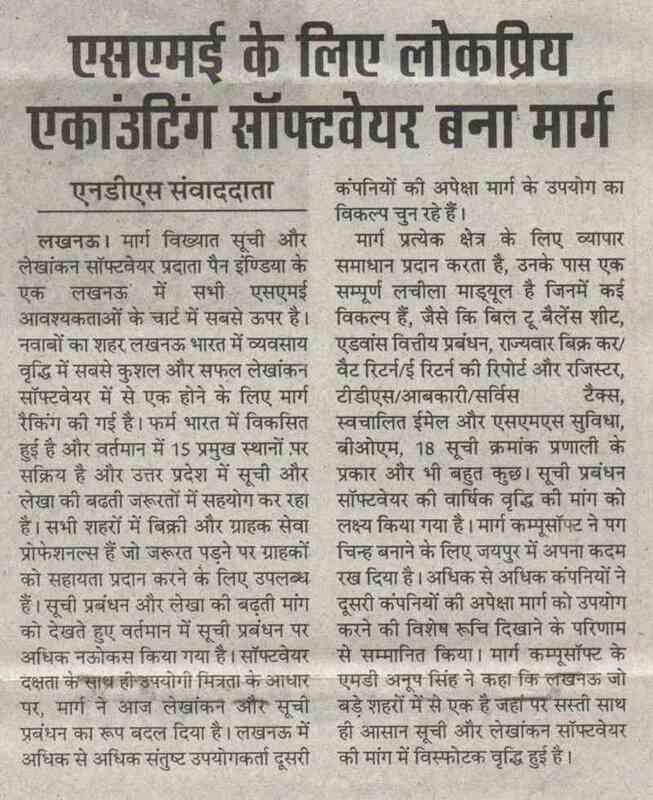 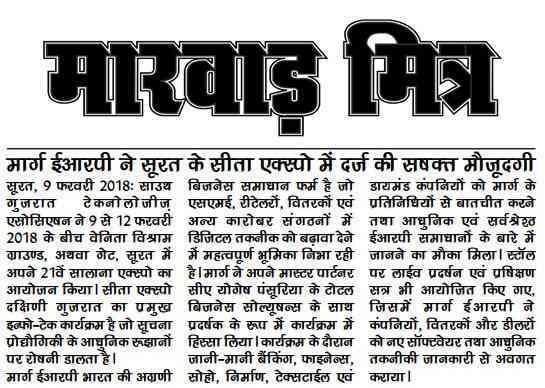 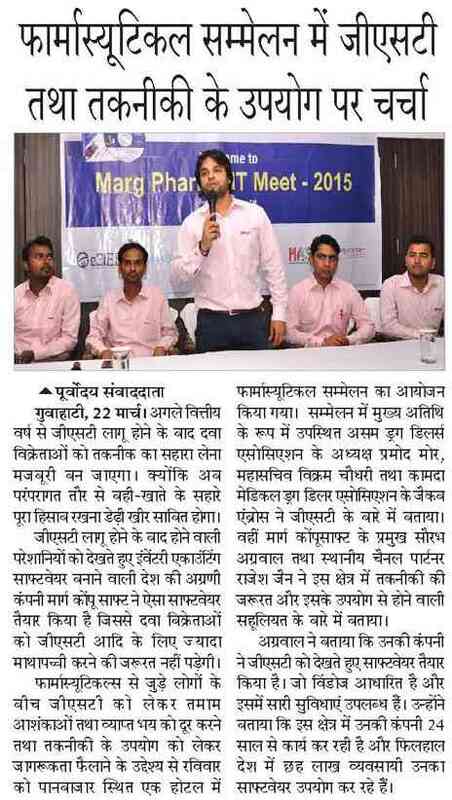 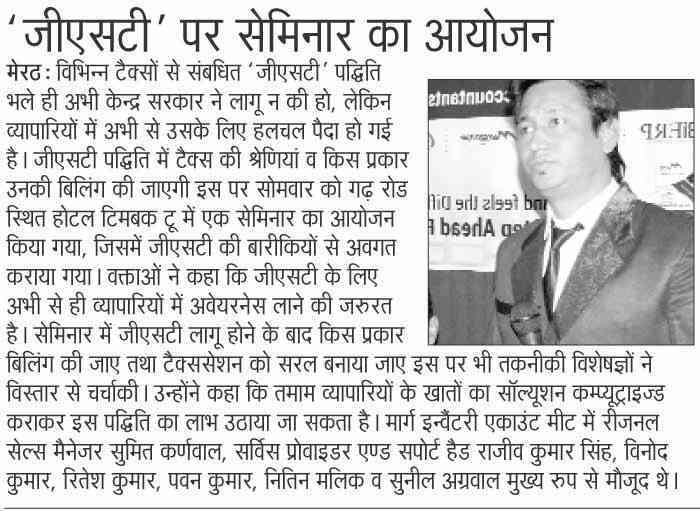 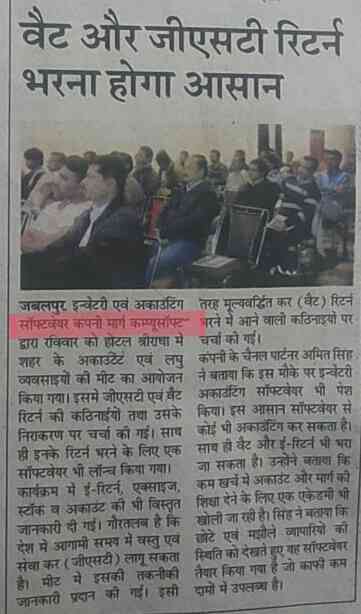 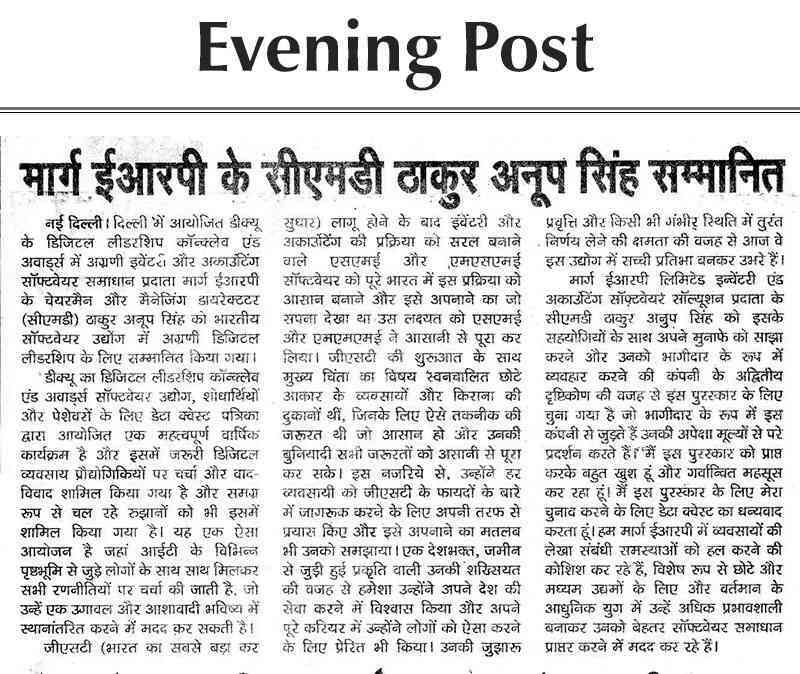 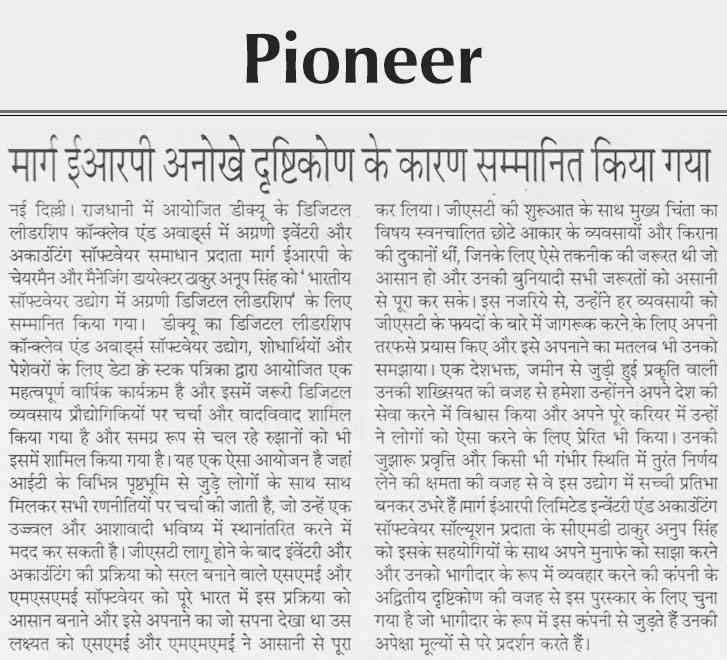 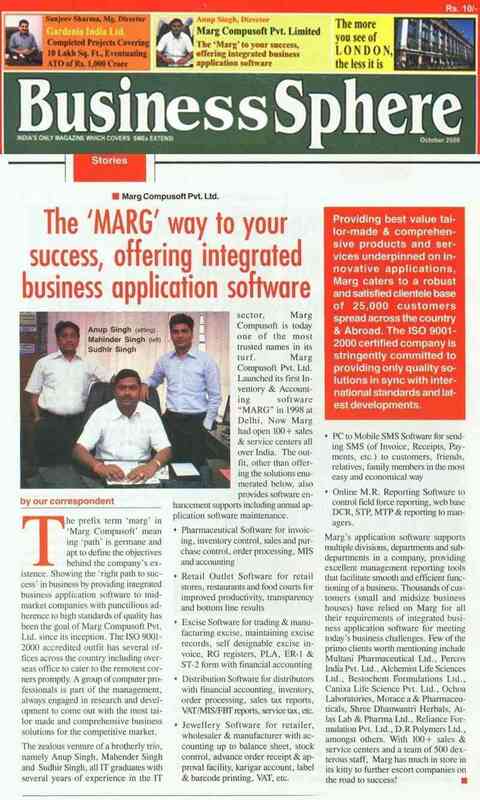 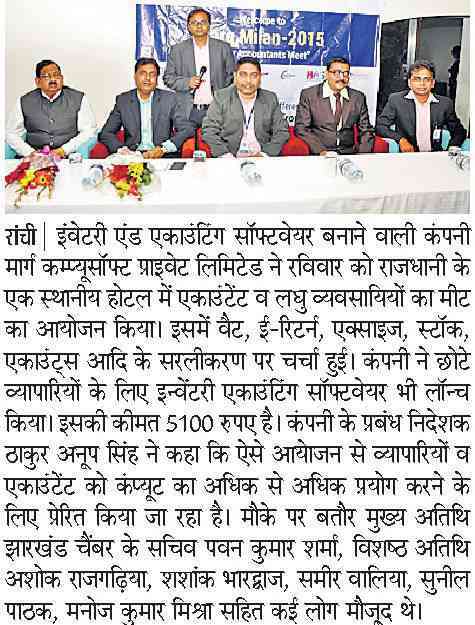 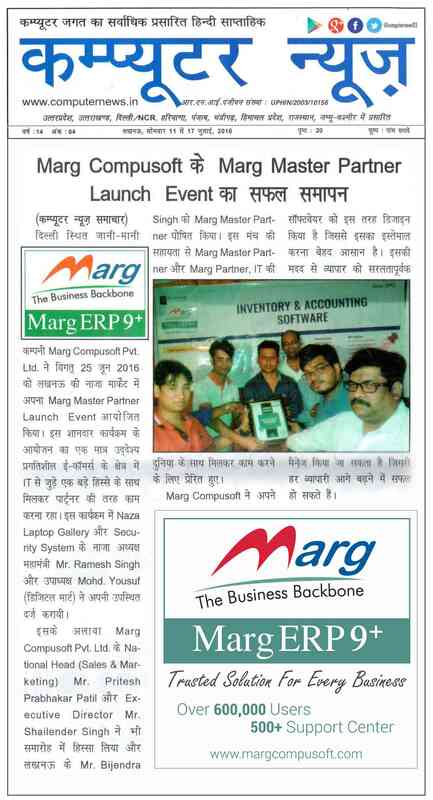 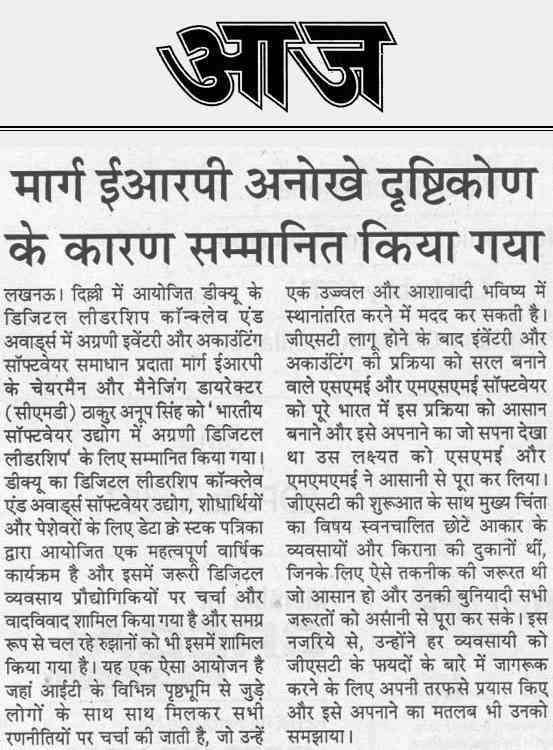 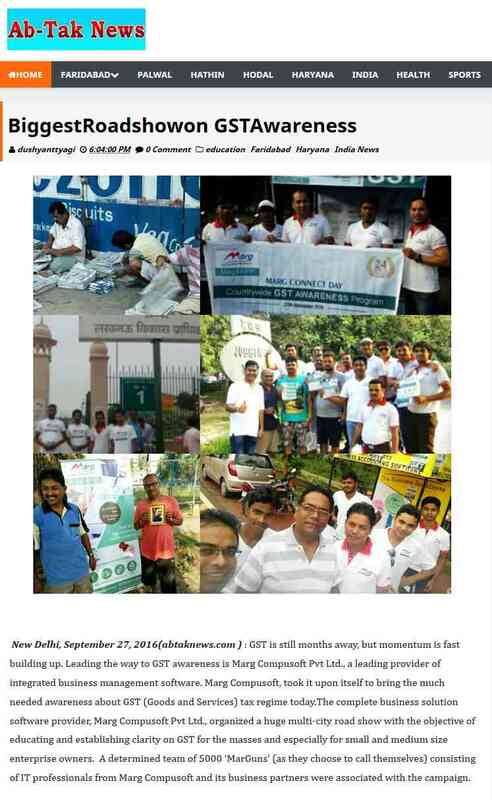 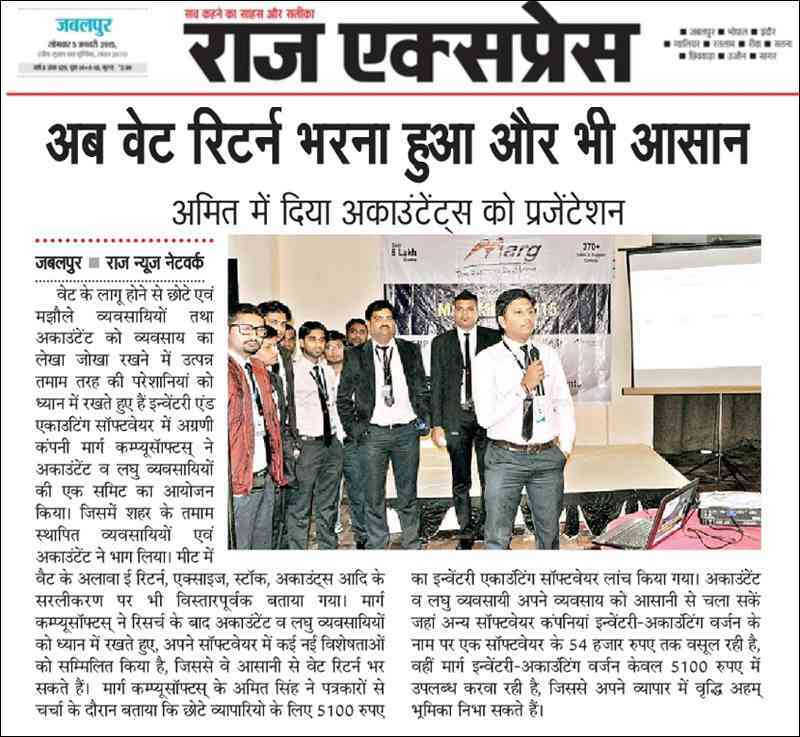 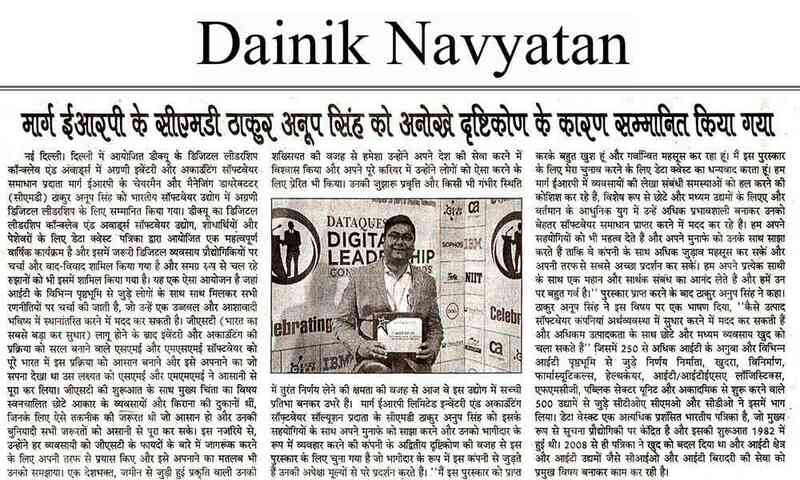 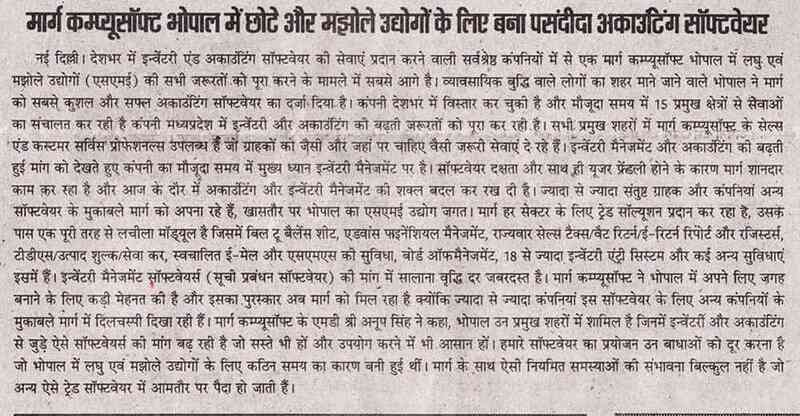 We are glad to share that "Computer News" Lucknow published article about "Marg Compusoft Ke Marg Master Partner Launch Event Ka Safal Samapan" in their July 2016 edition print. 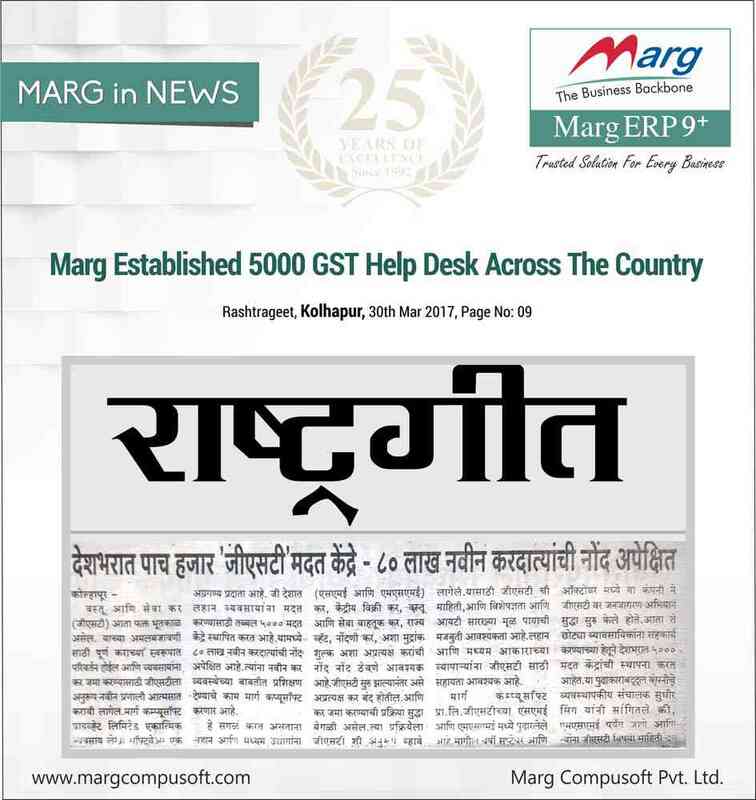 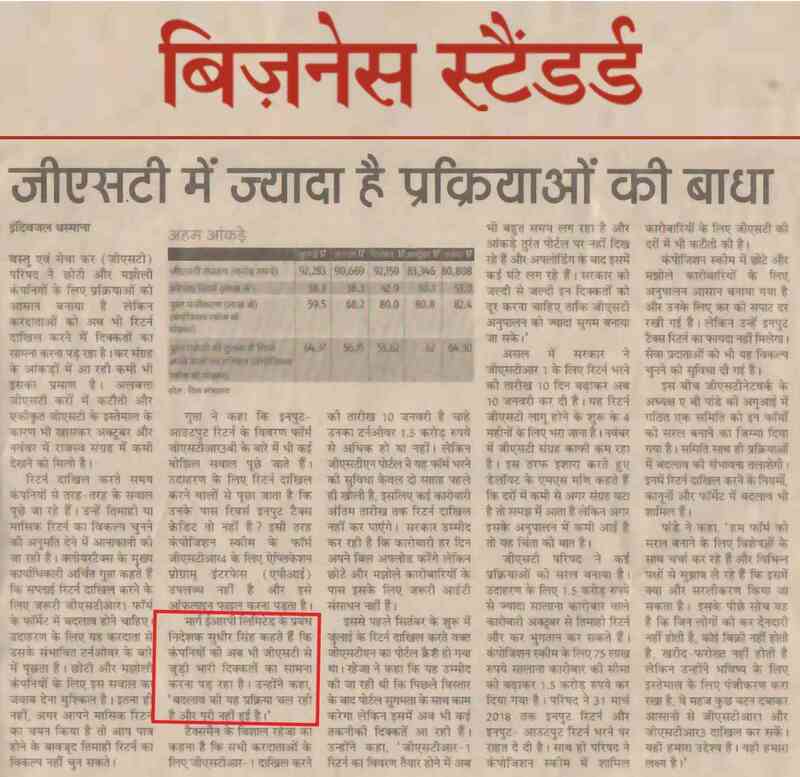 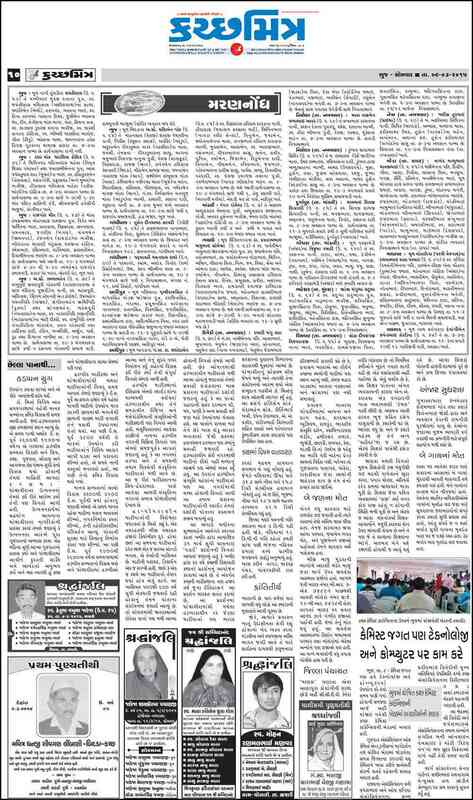 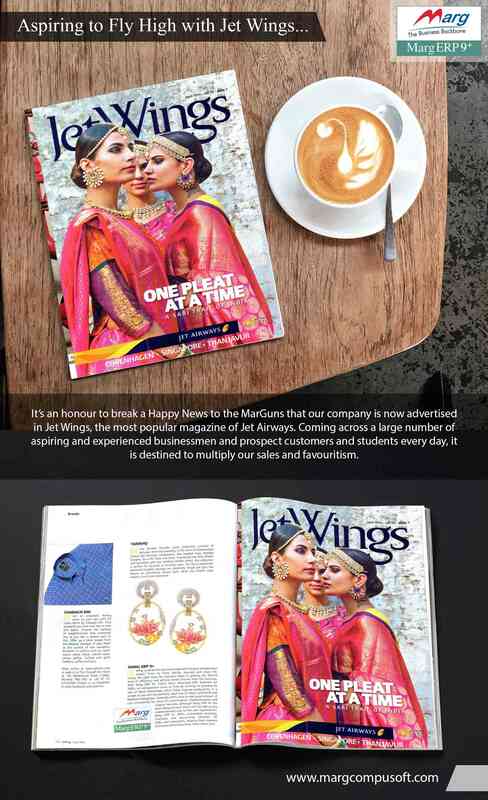 The newspaper has circulation of 55000+ hardcopy print to IT software , Hardware companies, Institutes and Computer dealers across North & East India states - UP, UK, Delhi NCR, Haryana, HP, Punjab, Chandigarh, J&K etc. 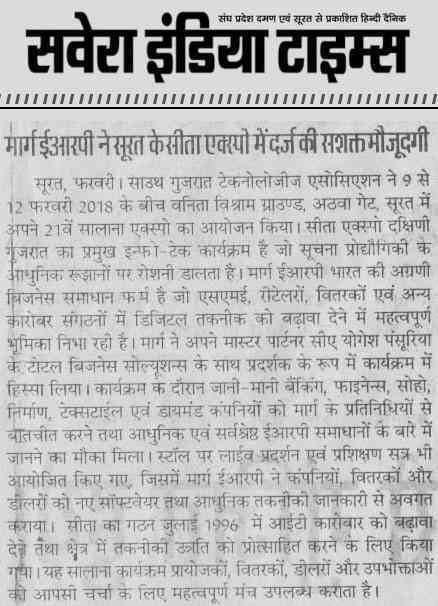 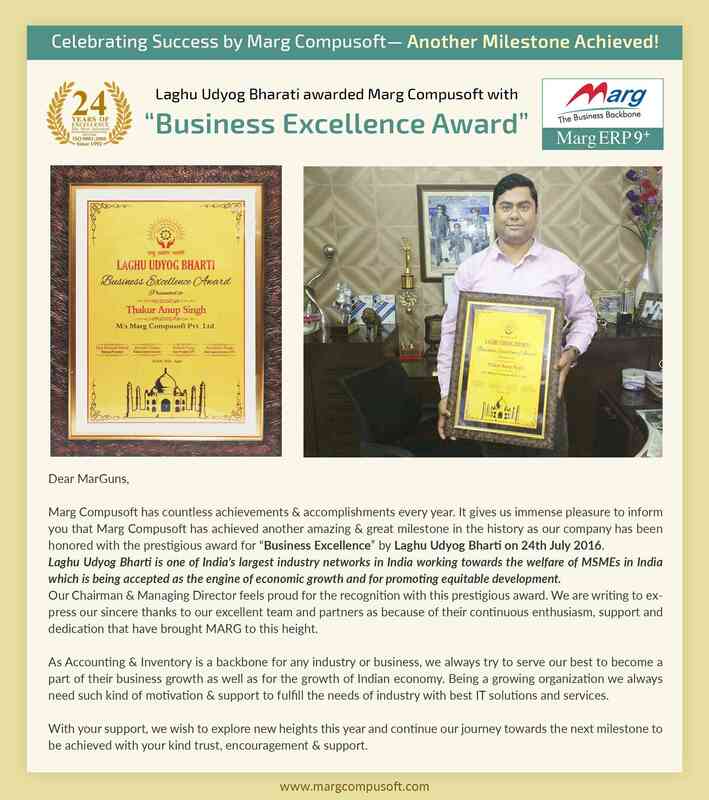 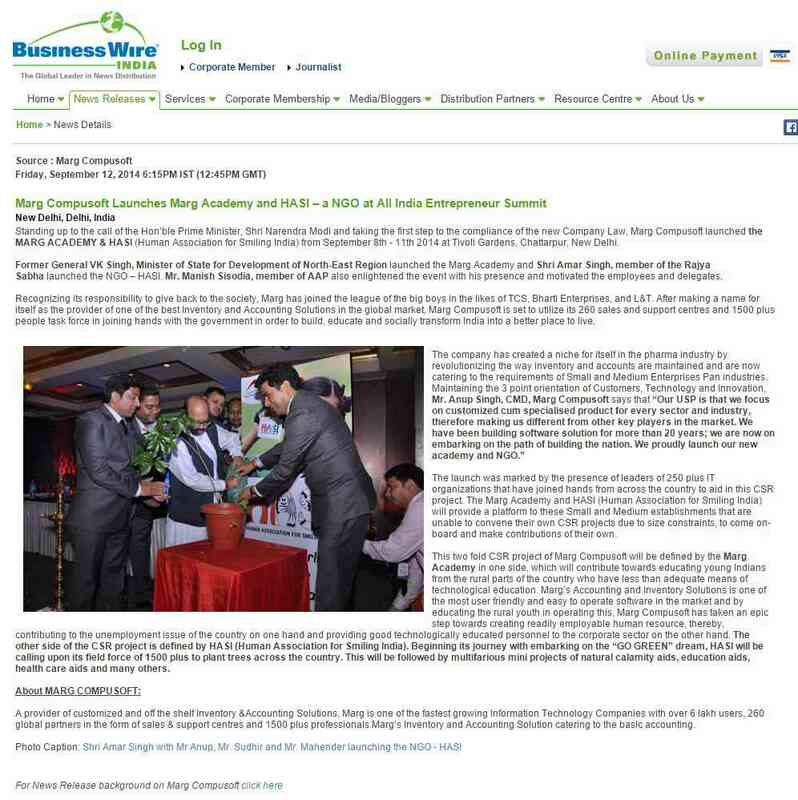 It’s a proud honor for Marg Compusoft Pvt Ltd , Inventory & accounting Software company to receive “Business Excellence Award” from Laghu Udyog Bharati, Agra who is India’s one of largest industry networks working towards the welfare of MSME in India. 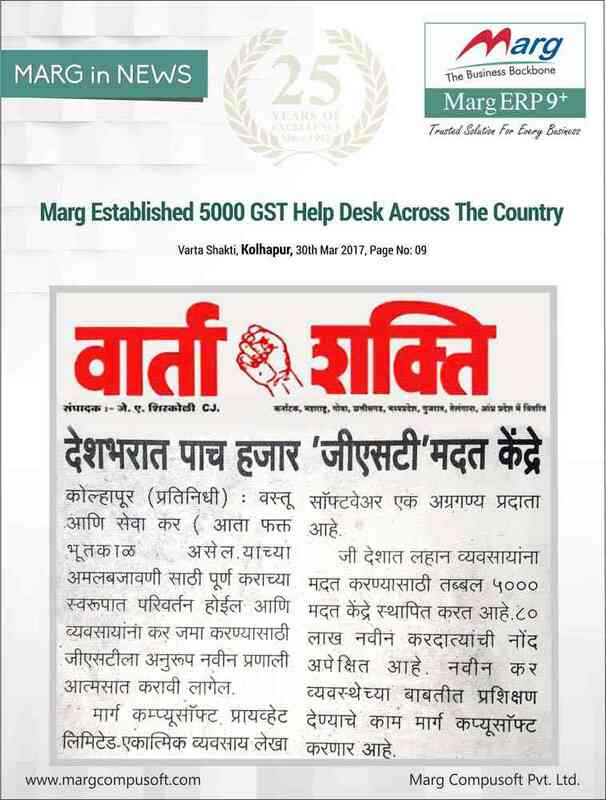 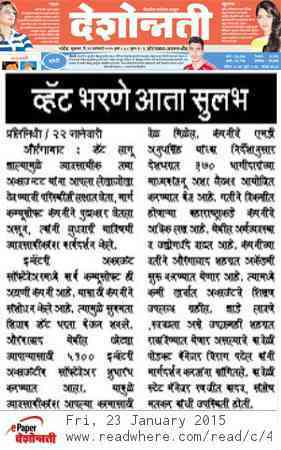 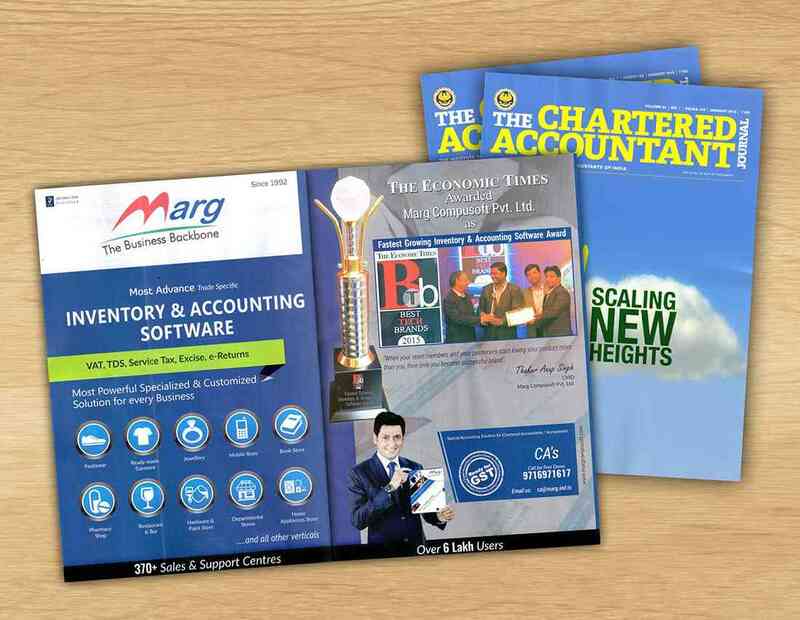 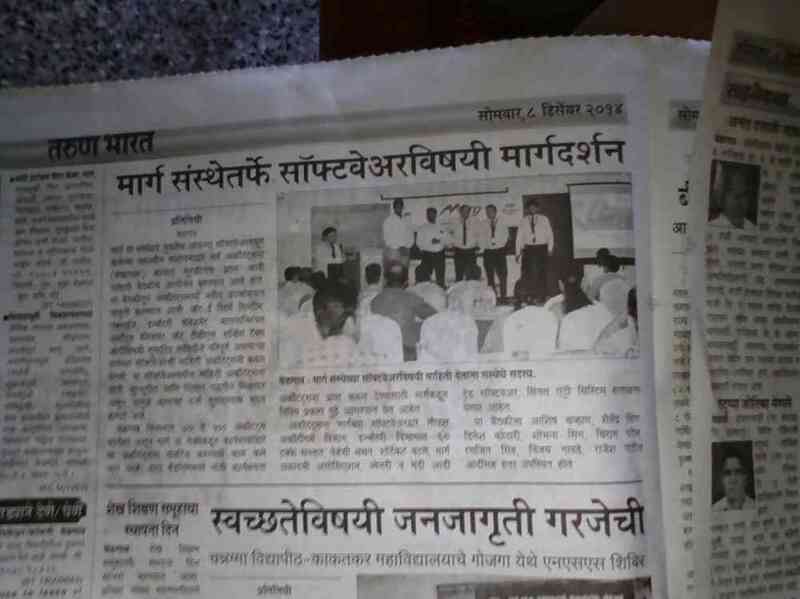 The Magazine has circulation of 1800+computer dealers firms across Maharashtra & Goa. 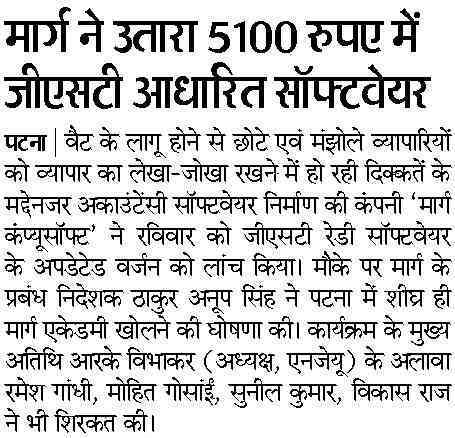 This will provide great opportunity to enhance our reach to the IT fraternity. 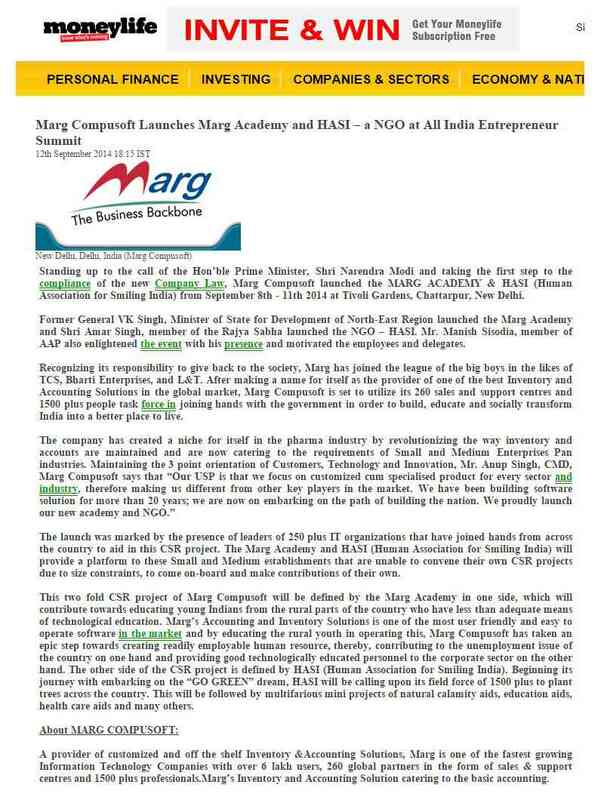 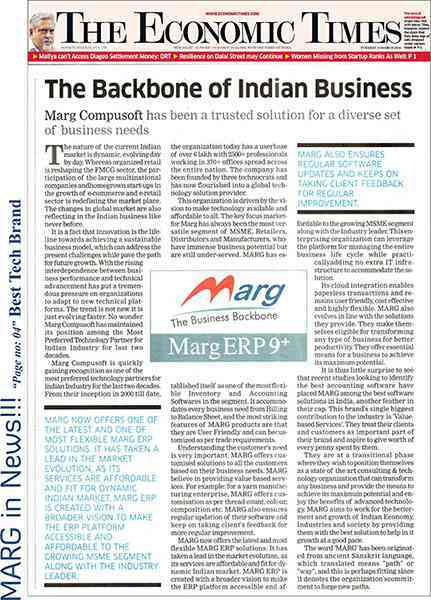 Marg is the backbone of the Indian Business. 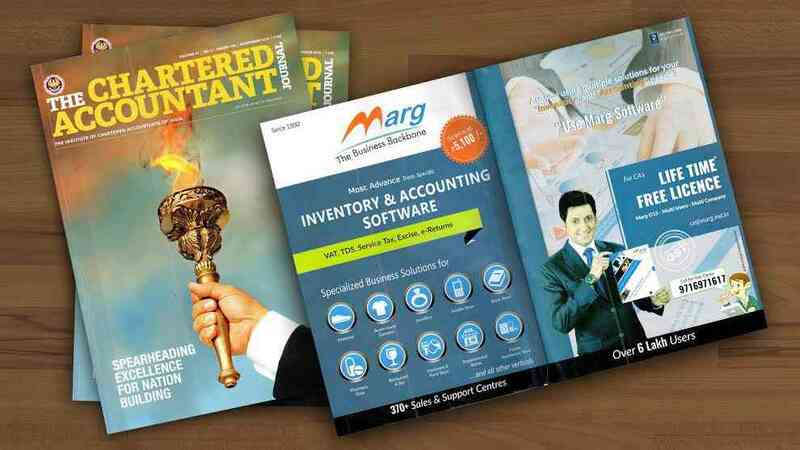 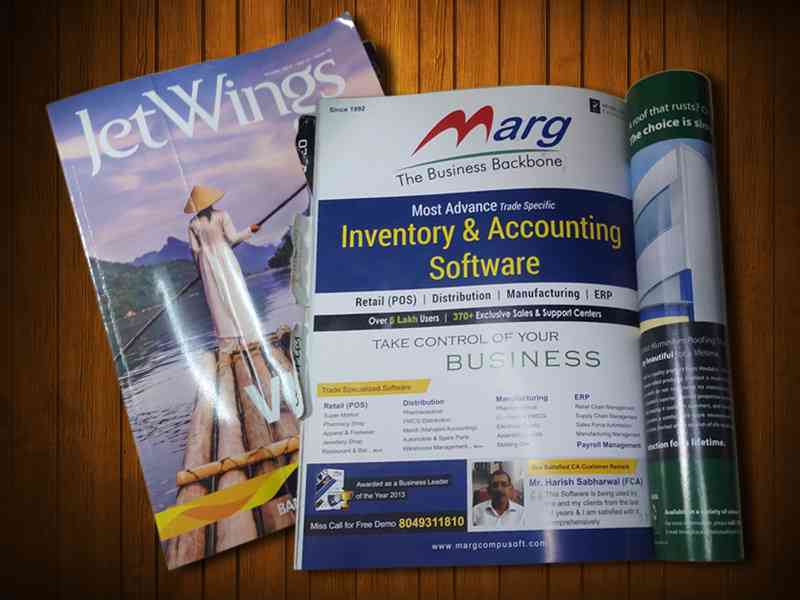 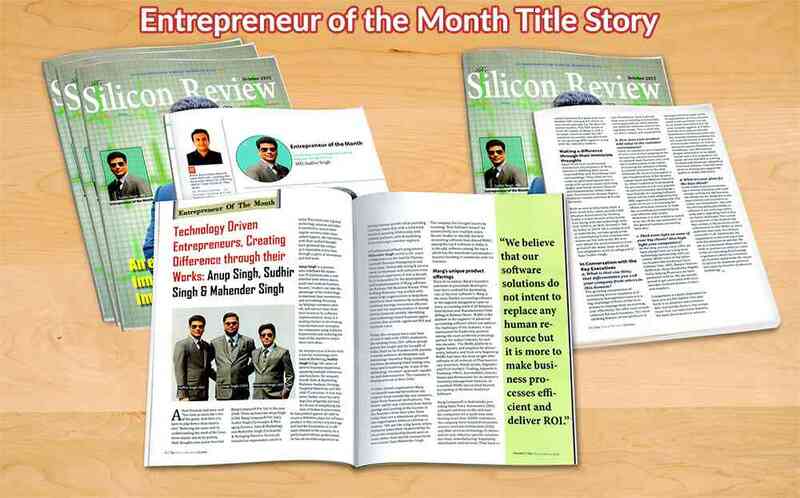 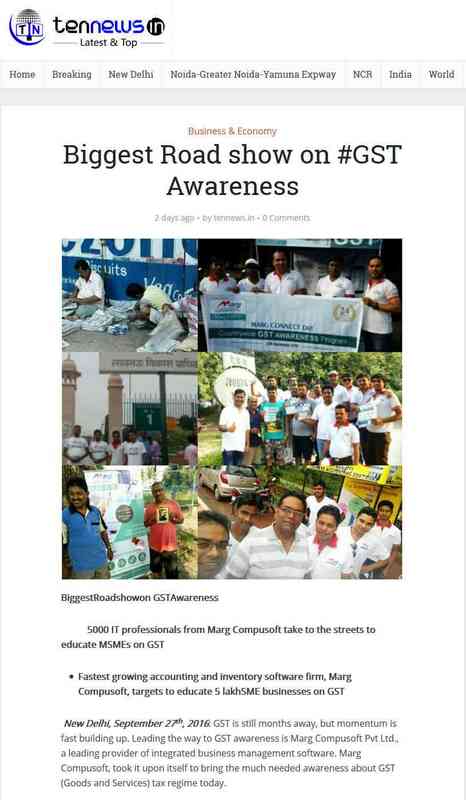 Marg Compusoft got the opportunity to share and publish "3 Pages Inside Story /Article" about MARG in "SILICON REVIEW"-Business & Technology Magazine" under "Company of the Month Title Story".